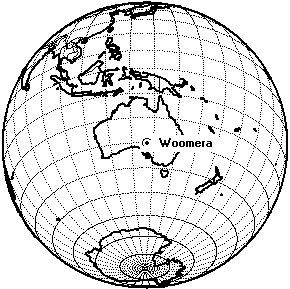 Woomera Instrumented Range. After World War II British government recognized the need for a large range to test the incredible array of long-range missile systems then planned. After considering sites in Canada, it was decided that Australia would best meet the projected needs. The Long Range Weapons Establishment was created on 1 April 1947 as a joint British/Australian enterprise. 23 days later the name Woomera (an aboriginal word of atlatl, or spear thrower) was selected for the new town to be built as its administrative center. Woomera town peaked at a population of 6,000 in the 1960's. Thereafter the progressive cancellation of British missile and space projects put Woomera went into sustained decline. However it played a key role in the history of rocketry, including orbital launches or launch attempts by Black Arrow, Sparta, and Europa boosters. First Launch: 1957-02-13. Last Launch: 2010-03-22. Number: 606 . Location: Woomera, South Australia. Longitude: 136.50 deg. Latitude: -30.96 deg. By the late 1990's the population was below 1,000, a third of those being Americans working at a Defense Support Program satellite control center. There were hopes that Kistler would use the site for their reusable launch vehicle, but the collapse of that enterprise ended those hopes. In September 14, 1999 SpaceLift Australia announced plans to launch satellite payloads from Woomera using a modified Russian SS-25 missile. A test launch was announced for late 2000. However, as was the case with other Australian schemes to provide Russian launch services, it did not come to pass. As of 2007 over 518 launches were known to have been made from Woomera since 1957. Minimum Inclination: 82.0 degrees. Maximum Inclination: 84.0 degrees. Woomera LA1 S launch complex. Family: Europa, Jaguar, Orbital Launch Site. Country: Australia. Spacecraft: Wresat, STV, Prospero. Launch Vehicles: Skylark 1, Long Tom, Skylark 2, Black Knight 201, Aeolus, Aerobee 150, Rook, HAT, Skylark 2C, Black Knight 201/C, Jaguar 1, Europa I, HAD, Skylark 5C, Skylark 5, Black Knight 301/C, Skylark 7C, Skylark 7, Black Knight 201/C2, Blue Streak, Aero High, Black Knight 301/C2, Jaguar 2, Skylark 3, Rook IIIA, Black Brant VB, Skylark 3 AC, ELDO A, SPARTA, Jabiru 2, Skylark 6, Kookaburra, Aerobee 170, Skylark 6 AC, Black Arrow, Stonechat I, Cockatoo, Jabiru 3, Aerobee 200A, Lorikeet, Aerobee 200, Skylark 10A, Skylark 7 AC, Falstaff, Corella, Talos Castor, Black Brant IX, Terrier Orion, Terrier Mk 70 Orion, NAL-735. Launch Sites: Woomera LA2 SL, Woomera LA5A, Woomera LA2, Woomera LA2 HRV, Woomera LA5B, Woomera LA6A, Woomera LA8, Woomera LA2 D, Woomera LA2 N, Woomera LA1, Woomera LA3, Woomera LA4, Woomera LA9, Woomera HAD, Woomera MRL. Agency: WRE. Bibliography: 2, 572. 1957 February 13 - . 01:51 GMT - . Launch Site: Woomera. Launch Complex: Woomera LA2. Launch Pad: LA2 SL. Launch Vehicle: Skylark. Test mission - . Nation: Australia. Agency: Royal Aerospace Establishment, WRE. Apogee: 12 km (7 mi). 1957 May 22 - . 05:20 GMT - . Launch Site: Woomera. Launch Complex: Woomera LA2. Launch Pad: LA2 SL. Launch Vehicle: Skylark. Test mission - . Nation: Australia. Agency: Royal Aerospace Establishment, WRE. Apogee: 75 km (46 mi). 1957 July 23 - . 03:02 GMT - . Launch Site: Woomera. Launch Complex: Woomera LA2. Launch Pad: LA2 SL. Launch Vehicle: Skylark. Photometers Test / aeronomy mission - . Nation: Australia. Agency: Royal Aerospace Establishment, WRE. Apogee: 85 km (52 mi). 1957 October 1 - . Launch Site: Woomera. Launch Complex: Woomera LA2. Launch Vehicle: Long Tom. Test mission - . Nation: Australia. Agency: WRE. Apogee: 100 km (60 mi). 1957 November 13 - . 11:52 GMT - . Launch Site: Woomera. Launch Complex: Woomera LA2. Launch Pad: LA2 SL. Launch Vehicle: Skylark. Grenade / Chaff / Sodium release Test / aeronomy mission - . Nation: Australia. Agency: Royal Aerospace Establishment, WRE. Apogee: 127 km (78 mi). 1958 - . Launch Site: Woomera. Launch Complex: Woomera LA2. Launch Vehicle: Long Tom. 1958 April 1 - . 20:32 GMT - . Launch Site: Woomera. Launch Complex: Woomera LA2. Launch Pad: LA2 SL. Launch Vehicle: Skylark. Dummy probe test - . Nation: Australia. Agency: Royal Aerospace Establishment, WRE. Apogee: 42 km (26 mi). 1958 April 17 - . 10:57 GMT - . Launch Site: Woomera. Launch Complex: Woomera LA2. Launch Pad: LA2 SL. Launch Vehicle: Skylark. Grenade / Chaff / Sodium release Test / aeronomy mission - . Nation: Australia. Agency: Royal Aerospace Establishment, WRE. Apogee: 152 km (94 mi). 1958 May 20 - . 04:26 GMT - . Launch Site: Woomera. Launch Complex: Woomera LA2. Launch Pad: LA2 SL. Launch Vehicle: Skylark. Photometers Test / aeronomy mission - . Nation: Australia. Agency: Royal Aerospace Establishment, WRE. Apogee: 150 km (90 mi). 1958 June 5 - . 11:30 GMT - . Launch Site: Woomera. Launch Complex: Woomera LA2. Launch Pad: LA2 SL. Launch Vehicle: Skylark. FAILURE: Failure. Test mission - . Nation: Australia. Agency: Royal Aerospace Establishment, WRE. Apogee: 153 km (95 mi). 1958 June 18 - . 10:35 GMT - . Launch Site: Woomera. Launch Complex: Woomera LA2. Launch Pad: LA2 SL. Launch Vehicle: Skylark. FAILURE: Failure. Grenade / Chaff / Sodium release Aeronomy mission - . Nation: Australia. Agency: Royal Aerospace Establishment, WRE. Apogee: 3.00 km (1.80 mi). 1958 June 18 - . 15:15 GMT - . Launch Site: Woomera. Launch Complex: Woomera LA2. Launch Pad: LA2 SL. Launch Vehicle: Skylark. Grenade / Chaff / Sodium release Aeronomy mission - . Nation: Australia. Agency: Royal Aerospace Establishment, WRE. Apogee: 144 km (89 mi). 1958 June 19 - . 21:15 GMT - . Launch Site: Woomera. Launch Complex: Woomera LA2. Launch Pad: LA2 SL. Launch Vehicle: Skylark. Grenade / Chaff / Sodium release Test / aeronomy mission - . Nation: Australia. Agency: Royal Aerospace Establishment, WRE. Apogee: 154 km (95 mi). 1958 September 7 - . 10:33 GMT - . Launch Site: Woomera. Launch Complex: Woomera LA5A. Launch Vehicle: Black Knight. Research and development test - . Nation: UK. Agency: Royal Aerospace Establishment. Apogee: 225 km (139 mi). Black Knight missile of the United Kingdom was launched from the Australian range at Woomera to an altitude of over 300 miles..
1958 December 3 - . 10:13 GMT - . Launch Site: Woomera. Launch Complex: Woomera LA2. Launch Pad: LA2 SL. Launch Vehicle: Skylark. Sodium release Aeronomy mission - . Nation: Australia. Agency: Royal Aerospace Establishment, WRE. Apogee: 126 km (78 mi). 1958 December 4 - . 01:13 GMT - . Launch Site: Woomera. LV Family: Long Tom. Launch Vehicle: Aeolus. Aeronomy mission - . Nation: Australia. Agency: WRE. Apogee: 78 km (48 mi). 1959? - . Launch Site: Woomera. LV Family: Long Tom. Launch Vehicle: Aeolus. Aeronomy mission - . Nation: Australia. Agency: WRE. Apogee: 81 km (50 mi). 1959 - . Launch Site: Woomera. Launch Complex: Woomera LA1. Launch Vehicle: Long Tom. Nation: Australia. Agency: WRE. Apogee: 80 km (49 mi). 1959 March 4 - . 11:14 GMT - . Launch Site: Woomera. Launch Complex: Woomera LA2. Launch Pad: LA2 SL. Launch Vehicle: Skylark. FAILURE: Failure. Grenade / Chaff / Sodium release Aeronomy mission - . Nation: Australia. Agency: Royal Aerospace Establishment, WRE. Apogee: 30 km (18 mi). 1959 March 12 - . 10:50 GMT - . Launch Site: Woomera. Launch Complex: Woomera LA5A. Launch Vehicle: Black Knight. Research and development test - . Nation: UK. Agency: Royal Aerospace Establishment. Apogee: 537 km (333 mi). Second British Black Knight rocket reached 350-mile altitude at Woomera, Australia..
1959 May 1 - . Launch Site: Woomera. Launch Complex: Woomera LA2. Launch Vehicle: Long Tom. 1959 June 11 - . 13:03 GMT - . Launch Site: Woomera. Launch Complex: Woomera LA5A. Launch Vehicle: Black Knight. Research and development launch - . Nation: UK. Agency: Royal Aerospace Establishment. Apogee: 803 km (498 mi). 1959 June 29 - . 11:33 GMT - . Launch Site: Woomera. Launch Complex: Woomera LA5A. Launch Vehicle: Black Knight. Research and development launch - . Nation: UK. Agency: Royal Aerospace Establishment. Apogee: 442 km (274 mi). 1959 July 1 - . 00:05 GMT - . Launch Site: Woomera. Launch Complex: Woomera LA2. Launch Pad: LA2 SL. Launch Vehicle: Skylark. Test mission - . Nation: Australia. Agency: Royal Aerospace Establishment, WRE. Apogee: 50 km (31 mi). 1959 July 8 - . 00:13 GMT - . Launch Site: Woomera. Launch Complex: Woomera LA2. Launch Pad: LA2 SL. Launch Vehicle: Skylark. LangP / Solar X-ray Ionosphere-solar mission Ionosphere-solar mission - . Nation: Australia. Agency: Royal Aerospace Establishment, WRE. Apogee: 93 km (57 mi). 1959 July 9 - . Launch Site: Woomera. Launch Vehicle: Gosling-Lobster. Jaguar R&D - . Nation: Australia. Agency: WRE. Apogee: 20 km (12 mi). 1959 July 23 - . 01:26 GMT - . Launch Site: Woomera. Launch Complex: Woomera LA2. Launch Pad: LA2 SL. Launch Vehicle: Skylark. FAILURE: Failure. Test mission - . Nation: Australia. Agency: Royal Aerospace Establishment, WRE. Apogee: 91 km (56 mi). 1959 August 19 - . 00:20 GMT - . Launch Site: Woomera. Launch Complex: Woomera LA2. Launch Pad: LA2 SL. Launch Vehicle: Skylark. LangP Ionosphere mission - . Nation: Australia. Agency: Royal Aerospace Establishment, WRE. Apogee: 144 km (89 mi). 1959 August 21 - . Launch Site: Woomera. Launch Vehicle: Gosling-Lobster. 1959 September 17 - . 00:12 GMT - . Launch Site: Woomera. Launch Complex: Woomera LA2. Launch Pad: LA2 SL. Launch Vehicle: Skylark. Mass spectrometer / La / Solar X Ionosphere-solar mission Ionosphere-solar mission - . Nation: Australia. Agency: Royal Aerospace Establishment, WRE. Apogee: 132 km (82 mi). 1959 September 24 - . 00:29 GMT - . Launch Site: Woomera. Launch Complex: Woomera LA2. Launch Pad: LA2 SL. Launch Vehicle: Skylark. Mass spectrometer / SpE Ionosphere-solar mission Ionosphere-solar mission - . Nation: Australia. Agency: Royal Aerospace Establishment, WRE. Apogee: 158 km (98 mi). 1959 October 30 - . 11:49 GMT - . Launch Site: Woomera. Launch Complex: Woomera LA5A. Launch Vehicle: Black Knight. Research and development / Reentry Test / chemical release mission - . Nation: UK. Agency: Royal Aerospace Establishment. Apogee: 732 km (454 mi). 1959 November 18 - . Launch Site: Woomera. Launch Vehicle: Gosling-Lobster. 1959 November 30 - . 10:16 GMT - . Launch Site: Woomera. Launch Complex: Woomera LA2. Launch Pad: LA2 SL. Launch Vehicle: Skylark. Sodium release Aeronomy mission - . Nation: Australia. Agency: Royal Aerospace Establishment, WRE. Apogee: 151 km (93 mi). 1959 November 30 - . 12:35 GMT - . Launch Site: Woomera. Launch Complex: Woomera LA2. Launch Pad: LA2 SL. Launch Vehicle: Skylark. Grenades / Chaff Aeronomy mission - . Nation: Australia. Agency: Royal Aerospace Establishment, WRE. Apogee: 163 km (101 mi). 1959 December 1 - . 11:36 GMT - . Launch Site: Woomera. Launch Complex: Woomera LA2. Launch Pad: LA2 SL. Launch Vehicle: Skylark. Grenades / Chaff / probe Aeronomy mission - . Nation: Australia. Agency: Royal Aerospace Establishment, WRE. Apogee: 159 km (98 mi). 1960 - . Launch Site: Woomera. Launch Complex: Woomera LA1. Launch Vehicle: Long Tom. 1960 - . Launch Site: Woomera. Launch Complex: Woomera LA1. LV Family: Long Tom. Launch Vehicle: HAT. 1960? - . Launch Site: Woomera. LV Family: Long Tom. Launch Vehicle: Aeolus. 1960? - . Launch Site: Woomera. Launch Complex: Woomera LA2. Launch Pad: LA2?. Launch Vehicle: Rook. Test mission - . Nation: UK. Agency: Royal Aerospace Establishment. Apogee: 20 km (12 mi). 1960 March 23 - . 11:20 GMT - . Launch Site: Woomera. LV Family: Long Tom. Launch Vehicle: Aeolus. 1960 April 12 - . 03:18 GMT - . Launch Site: Woomera. Launch Complex: Woomera LA2. Launch Pad: LA2 SL. Launch Vehicle: Skylark. Test mission - . Nation: Australia. Agency: Royal Aerospace Establishment, WRE. Apogee: 218 km (135 mi). 1960 April 21 - . 10:35 GMT - . Launch Site: Woomera. Launch Complex: Woomera LA2. Launch Pad: LA2 SL. Launch Vehicle: Skylark. Grenades / Chaff Aeronomy mission - . Nation: Australia. Agency: Royal Aerospace Establishment, WRE. Apogee: 141 km (87 mi). 1960 May 24 - . 11:30 GMT - . Launch Site: Woomera. Launch Complex: Woomera LA5A. Launch Vehicle: Black Knight. FAILURE: Failure. Gaslight Re-entry Vehicle test - . Nation: UK. Agency: Royal Aerospace Establishment. Apogee: 563 km (349 mi). 1960 June 2 - . Launch Site: Woomera. Launch Vehicle: Gosling-Lobster. 1960 June 16 - . 12:04 GMT - . Launch Site: Woomera. Launch Complex: Woomera LA2. Launch Pad: LA2 SL. Launch Vehicle: Skylark. Sodium release / Meteorites Aeronomy mission - . Nation: Australia. Agency: Royal Aerospace Establishment, WRE. Apogee: 129 km (80 mi). 1960 June 21 - . 10:05 GMT - . Launch Site: Woomera. Launch Complex: Woomera LA5A. Launch Vehicle: Black Knight. Gaslight Re-entry Vehicle test - . Nation: UK. Agency: Royal Aerospace Establishment. Apogee: 484 km (300 mi). 1960 July 25 - . 11:54 GMT - . Launch Site: Woomera. Launch Complex: Woomera LA5A. Launch Vehicle: Black Knight. Gaslight Re-entry Vehicle test - . Nation: UK. Agency: Royal Aerospace Establishment. Apogee: 531 km (329 mi). 1960 July 28 - . 19:36 GMT - . Launch Site: Woomera. Launch Complex: Woomera LA2. Launch Vehicle: Long Tom. Aeronomy mission - . Nation: Australia. Agency: WRE. Apogee: 126 km (78 mi). 1960 August 10 - . Launch Site: Woomera. Launch Vehicle: Gosling-Lobster. 1960 August 10 - . 10:35 GMT - . Launch Site: Woomera. Launch Complex: Woomera LA2. Launch Pad: LA2 SL. Launch Vehicle: Skylark. Grenades / Chaff test - . Nation: Australia. Agency: Royal Aerospace Establishment, WRE. Apogee: 171 km (106 mi). 1960 August 26 - . 11:00 GMT - . Launch Site: Woomera. Launch Complex: Woomera LA2. Launch Pad: LA2 SL. Launch Vehicle: Skylark. Sodium release / Meteorites Aeronomy mission - . Nation: Australia. Agency: Royal Aerospace Establishment, WRE. Apogee: 109 km (67 mi). 1960 September 22 - . Launch Site: Woomera. Launch Vehicle: Gosling-Lobster. 1960 November 16 - . 11:02 GMT - . Launch Site: Woomera. Launch Complex: Woomera LA2. Launch Pad: LA2 SL. Launch Vehicle: Skylark. Test mission - . Nation: Australia. Agency: Royal Aerospace Establishment, WRE. Apogee: 105 km (65 mi). 1960 November 17 - . 10:40 GMT - . Launch Site: Woomera. Launch Complex: Woomera LA2. Launch Pad: LA2 SL. Launch Vehicle: Skylark. Grenade / Chaff / Sodium release Aeronomy mission - . Nation: Australia. Agency: Royal Aerospace Establishment, WRE. Apogee: 247 km (153 mi). 1960 November 23 - . 23:55 GMT - . Launch Site: Woomera. Launch Complex: Woomera LA2. Launch Pad: LA2 SL. Launch Vehicle: Skylark. CW Prop / Solar SX Ionosphere-solar mission Ionosphere-solar mission - . Nation: Australia. Agency: Royal Aerospace Establishment, WRE. Apogee: 160 km (90 mi). 1960 December 7 - . 00:20 GMT - . Launch Site: Woomera. Launch Complex: Woomera LA2. Launch Pad: LA2 SL. Launch Vehicle: Skylark. FAILURE: Failure. CW Prop / Solar SX Ionosphere mission - . Nation: Australia. Agency: Royal Aerospace Establishment, WRE. Apogee: 35 km (21 mi). 1960 December 15 - . Launch Site: Woomera. Launch Complex: Woomera LA2. Launch Pad: LA2 HRV. LV Family: Rook. Launch Vehicle: Jaguar 1. Test mission - . Nation: UK. Agency: Royal Aerospace Establishment. Apogee: 24 km (14 mi). 1961 - . Launch Site: Woomera. Launch Complex: Woomera LA1. Launch Vehicle: Long Tom. 1961? - . Launch Site: Woomera. LV Family: Long Tom. Launch Vehicle: Aeolus. 1961 February 7 - . 12:46 GMT - . Launch Site: Woomera. Launch Complex: Woomera LA5A. Launch Vehicle: Black Knight. Gaslight Re-entry Vehicle test - . Nation: UK. Agency: Royal Aerospace Establishment. Apogee: 687 km (426 mi). 1961 February 13 - . 13:58 GMT - . Launch Site: Woomera. Launch Complex: Woomera LA2. Launch Pad: LA2 SL. Launch Vehicle: Skylark. Grenades / Chaff Aeronomy mission - . Nation: Australia. Agency: Royal Aerospace Establishment, WRE. Apogee: 146 km (90 mi). 1961 March 6 - . 09:56 GMT - . Launch Site: Woomera. Launch Complex: Woomera LA2. Launch Pad: LA2 SL. Launch Vehicle: Skylark. Grenade / Chaff / Sodium release Aeronomy mission - . Nation: Australia. Agency: Royal Aerospace Establishment, WRE. Apogee: 231 km (143 mi). 1961 April 5 - . 10:56 GMT - . Launch Site: Woomera. Launch Complex: Woomera LA2. Launch Pad: LA2 SL. Launch Vehicle: Skylark. Grenades / Chaff Aeronomy mission - . Nation: Australia. Agency: Royal Aerospace Establishment, WRE. Apogee: 158 km (98 mi). 1961 April 21 - . Launch Site: Woomera. Launch Complex: Woomera LA2. Launch Pad: LA2 HRV. LV Family: Rook. Launch Vehicle: Jaguar 1. 1961 April 24 - . 02:53 GMT - . Launch Site: Woomera. Launch Complex: Woomera LA2. LV Family: Lupus. Launch Vehicle: HAD. Aeronomy mission - . Nation: Australia. Agency: WRE. Apogee: 58 km (36 mi). 1961 May 1 - . 12:10 GMT - . Launch Site: Woomera. Launch Complex: Woomera LA2. Launch Pad: LA2 SL. Launch Vehicle: Skylark. Stellar ultraviolet Ultraviolet astronomy mission - . Nation: Australia. Agency: Royal Aerospace Establishment, WRE. Apogee: 155 km (96 mi). 1961 May 9 - . 12:07 GMT - . Launch Site: Woomera. Launch Complex: Woomera LA5B. Launch Vehicle: Black Knight. FAILURE: Failure. Gaslight Re-entry Vehicle test - . Nation: UK. Agency: Royal Aerospace Establishment. Apogee: 415 km (257 mi). 1961 May 30 - . 05:15 GMT - . Launch Site: Woomera. Launch Complex: Woomera LA2. Launch Pad: LA2 SL. Launch Vehicle: Skylark. Test mission - . Nation: Australia. Agency: Royal Aerospace Establishment, WRE. Apogee: 149 km (92 mi). 1961 June 7 - . 00:40 GMT - . Launch Site: Woomera. Launch Complex: Woomera LA2. Launch Pad: LA2 SL. Launch Vehicle: Skylark. Test mission - . Nation: Australia. Agency: Royal Aerospace Establishment, WRE. Apogee: 184 km (114 mi). 1961 June 7 - . 11:20 GMT - . Launch Site: Woomera. Launch Complex: Woomera LA5B. Launch Pad: LA5B?. Launch Vehicle: Black Knight. FAILURE: Failure. Gaslight Re-entry Vehicle test - . Nation: UK. Agency: Royal Aerospace Establishment. Apogee: 583 km (362 mi). 1961 July 4 - . 10:23 GMT - . Launch Site: Woomera. Launch Complex: Woomera LA2. Launch Pad: LA2 SL. Launch Vehicle: Skylark. Grenades / Chaff Aeronomy mission - . Nation: Australia. Agency: Royal Aerospace Establishment, WRE. Apogee: 70 km (43 mi). 1961 July 26 - . Launch Site: Woomera. Launch Complex: Woomera LA2. Launch Pad: LA2 HRV. LV Family: Rook. Launch Vehicle: Jaguar 1. 1961 August 1 - . 11:02 GMT - . Launch Site: Woomera. Launch Complex: Woomera LA2. Launch Pad: LA2 SL. Launch Vehicle: Skylark. Ultraviolet Camera Ultraviolet astronomy mission - . Nation: Australia. Agency: Royal Aerospace Establishment, WRE. Apogee: 124 km (77 mi). 1961 September 18 - . 12:15 GMT - . Launch Site: Woomera. Launch Complex: Woomera LA2. Launch Pad: LA2 SL. Launch Vehicle: Skylark. Southern Sky Survey Ultraviolet Astronomy mission - . Nation: USA. Agency: NASA. Apogee: 193 km (119 mi). First of four scheduled Skylark rocket firings was launched from Woomera in the joint United States-Australian ultraviolet survey of the southern skies..
1961 September 27 - . 00:25 GMT - . Launch Site: Woomera. Launch Complex: Woomera LA2. Launch Pad: LA2 SL. Launch Vehicle: Skylark. Solar X-rays / B field / SpE Ionosphere-solar mission Ionosphere-solar mission - . Nation: Australia. Agency: Royal Aerospace Establishment, WRE. Apogee: 153 km (95 mi). 1961 October 4 - . 11:19 GMT - . Launch Site: Woomera. Launch Complex: Woomera LA2. Launch Pad: LA2 SL. Launch Vehicle: Skylark. Southern Sky Survey Ultraviolet astronomy mission - . Nation: USA. Agency: NASA. Apogee: 195 km (121 mi). 1961 October 24 - . 00:23 GMT - . Launch Site: Woomera. Launch Complex: Woomera LA2. Launch Pad: LA2 SL. Launch Vehicle: Skylark. Solar X-rays / Meteors / SpE Solar / aeronomy / chemica mission - . Nation: Australia. Agency: Royal Aerospace Establishment, WRE. Apogee: 142 km (88 mi). 1961 November 1 - . Launch Site: Woomera. Launch Complex: Woomera LA2. Launch Pad: LA2 HRV. LV Family: Rook. Launch Vehicle: Jaguar 1. 1961 November 1 - . 17:56 GMT - . Launch Site: Woomera. Launch Complex: Woomera LA2. Launch Pad: LA2 SL. Launch Vehicle: Skylark. Southern Sky Survey Ultraviolet astronomy mission - . Nation: USA. Agency: NASA. Apogee: 193 km (119 mi). 1961 November 8 - . 09:00 GMT - . Launch Site: Woomera. Launch Complex: Woomera LA2. Launch Pad: LA2 SL. Launch Vehicle: Skylark. Ozone / Meteors / SpE Aeronomy / chemical / ionosphere mission - . Nation: Australia. Agency: Royal Aerospace Establishment, WRE. Apogee: 152 km (94 mi). 1961 November 20 - . 18:04 GMT - . Launch Site: Woomera. Launch Complex: Woomera LA2. Launch Pad: LA2 SL. Launch Vehicle: Skylark. Southern Sky Survey Ultraviolet astronomy mission - . Nation: USA. Agency: NASA. Apogee: 209 km (129 mi). 1961 November 24 - . Launch Site: Woomera. Launch Complex: Woomera LA2. Launch Pad: LA2 SL. Launch Vehicle: Skylark. FAILURE: Failure. Solar X-rays / SpE / CW radio Ionosphere-solar mission Ionosphere-solar mission - . Nation: Australia. Agency: Royal Aerospace Establishment, WRE. Apogee: 0 km (0 mi). 1961 December 5 - . 23:26 GMT - . Launch Site: Woomera. Launch Complex: Woomera LA2. Launch Pad: LA2 SL. Launch Vehicle: Skylark. RF probe / Solar X, SpE Ionosphere / solar x-rays mission - . Nation: Australia. Agency: Royal Aerospace Establishment, WRE. Apogee: 226 km (140 mi). 1961 December 14 - . 10:29 GMT - . Launch Site: Woomera. Launch Complex: Woomera LA2. LV Family: Lupus. Launch Vehicle: HAD. Aeronomy mission - . Nation: Australia. Agency: WRE. Apogee: 130 km (80 mi). 1962 February 5 - . 20:58 GMT - . Launch Site: Woomera. Launch Complex: Woomera LA2. Launch Pad: LA2 SL. Launch Vehicle: Skylark. Test mission - . Nation: Australia. Agency: Royal Aerospace Establishment, WRE. Apogee: 215 km (133 mi). 1962 March 5 - . 09:55 GMT - . Launch Site: Woomera. Launch Complex: Woomera LA2. Launch Pad: LA2 SL. Launch Vehicle: Skylark. Grenades / Chaff / Sodium release Aeronomy mission - . Nation: Australia. Agency: Royal Aerospace Establishment, WRE. Apogee: 233 km (144 mi). 1962 March 6 - . 12:35 GMT - . Launch Site: Woomera. Launch Complex: Woomera LA2. Launch Pad: LA2 SL. Launch Vehicle: Skylark. Grenades / Chaff Aeronomy mission - . Nation: Australia. Agency: Royal Aerospace Establishment, WRE. Apogee: 173 km (107 mi). 1962 March 19 - . 11:04 GMT - . Launch Site: Woomera. Launch Complex: Woomera LA2. Launch Pad: LA2 SL. Launch Vehicle: Skylark. Grenades / Chaff Aeronomy mission - . Nation: Australia. Agency: Royal Aerospace Establishment, WRE. Apogee: 140 km (80 mi). 1962 March 29 - . 09:28 GMT - . Launch Site: Woomera. Launch Complex: Woomera LA2. LV Family: Lupus. Launch Vehicle: HAD. Aeronomy mission - . Nation: Australia. Agency: WRE. Apogee: 125 km (77 mi). 1962 April 4 - . Launch Site: Woomera. Launch Complex: Woomera LA2. Launch Pad: LA2 HRV. LV Family: Rook. Launch Vehicle: Jaguar 1. 1962 April 5 - . 15:47 GMT - . Launch Site: Woomera. Launch Complex: Woomera LA2. Launch Pad: LA2 SL. Launch Vehicle: Skylark. Grenades / Chaff Aeronomy mission - . Nation: Australia. Agency: Royal Aerospace Establishment, WRE. Apogee: 238 km (147 mi). 1962 April 10 - . 18:20 GMT - . Launch Site: Woomera. Launch Complex: Woomera LA2. Launch Pad: LA2 SL. Launch Vehicle: Skylark. FAILURE: Failure. Grenades / Chaff Aeronomy mission - . Nation: Australia. Agency: Royal Aerospace Establishment, WRE. Apogee: 0 km (0 mi). 1962 May 1 - . 13:13 GMT - . Launch Site: Woomera. Launch Complex: Woomera LA5B. Launch Pad: LA5B?. Launch Vehicle: Black Knight. Gaslight Re-entry Vehicle test - . Nation: UK. Agency: Royal Aerospace Establishment. Apogee: 795 km (493 mi). 1962 May 31 - . 03:01 GMT - . Launch Site: Woomera. Launch Complex: Woomera LA2. Launch Vehicle: Long Tom. 1962 June 6 - . 03:00 GMT - . Launch Site: Woomera. Launch Complex: Woomera LA2. Launch Pad: LA2 SL. Launch Vehicle: Skylark. Test mission - . Nation: Australia. Agency: Royal Aerospace Establishment, WRE. Apogee: 240 km (140 mi). 1962 June 20 - . 05:20 GMT - . Launch Site: Woomera. Launch Complex: Woomera LA2. Launch Pad: LA2 SL. Launch Vehicle: Skylark. Solar X-rays / La / Gren. / FS Aeronomy / solar x-ray mission - . Nation: Australia. Agency: Royal Aerospace Establishment, WRE. Apogee: 227 km (141 mi). 1962 June 26 - . Launch Site: Woomera. Launch Complex: Woomera LA2. Launch Pad: LA2 HRV. LV Family: Rook. Launch Vehicle: Jaguar 1. 1962 June 26 - . 08:38 GMT - . Launch Site: Woomera. Launch Complex: Woomera LA2. LV Family: Lupus. Launch Vehicle: HAD. Aeronomy mission - . Nation: Australia. Agency: WRE. Apogee: 116 km (72 mi). 1962 July 5 - . 03:46 GMT - . Launch Site: Woomera. Launch Complex: Woomera LA2. Launch Pad: LA2 SL. Launch Vehicle: Skylark. Grenades / Chaff Aeronomy mission - . Nation: Australia. Agency: Royal Aerospace Establishment, WRE. Apogee: 111 km (68 mi). 1962 August 1 - . Launch Site: Woomera. Launch Complex: Woomera LA2. Launch Pad: LA2 HRV. LV Family: Rook. Launch Vehicle: Jaguar 1. 1962 August 14 - . 15:20 GMT - . Launch Site: Woomera. Launch Complex: Woomera LA2. Launch Pad: LA2 SL. Launch Vehicle: Skylark. La / ion / ne Ionosphere mission - . Nation: Australia. Agency: Royal Aerospace Establishment, WRE. Apogee: 111 km (68 mi). 1962 August 24 - . 11:38 GMT - . Launch Site: Woomera. Launch Complex: Woomera LA5B. Launch Pad: LA5A. Launch Vehicle: Black Knight. Gaslight Re-entry Vehicle test - . Nation: UK. Agency: Royal Aerospace Establishment. Apogee: 573 km (356 mi). 1962 August 27 - . 09:08 GMT - . Launch Site: Woomera. Launch Complex: Woomera LA2. LV Family: Lupus. Launch Vehicle: HAD. Aeronomy mission - . Nation: Australia. Agency: WRE. Apogee: 114 km (70 mi). 1962 August 29 - . 01:01 GMT - . Launch Site: Woomera. Launch Complex: Woomera LA2. Launch Pad: LA2 SL. Launch Vehicle: Skylark. Test mission - . Nation: Australia. Agency: Royal Aerospace Establishment, WRE. Apogee: 109 km (67 mi). 1962 September 1 - . Launch Site: Woomera. Launch Complex: Woomera LA2. Launch Pad: LA2 HRV. Launch Vehicle: Rook. Bonorong 1 test - . Nation: UK. Agency: Royal Aerospace Establishment. Apogee: 20 km (12 mi). 1962 September 11 - . 13:30 GMT - . Launch Site: Woomera. Launch Complex: Woomera LA2. Launch Pad: LA2 SL. Launch Vehicle: Skylark. Elec / Ion / Lang probes Ionosphere mission - . Nation: Australia. Agency: Royal Aerospace Establishment, WRE. Apogee: 232 km (144 mi). 1962 September 20 - . 04:21 GMT - . Launch Site: Woomera. Launch Complex: Woomera LA2. Launch Pad: LA2 SL. Launch Vehicle: Skylark. Electron density Ionosphere mission - . Nation: Australia. Agency: Royal Aerospace Establishment, WRE. Apogee: 113 km (70 mi). 1962 October 15 - . 16:17 GMT - . Launch Site: Woomera. Launch Complex: Woomera LA2. Launch Pad: LA2 SL. Launch Vehicle: Skylark. Antenna test / SpE Ionosphere mission - . Nation: Australia. Agency: Royal Aerospace Establishment, WRE. Apogee: 154 km (95 mi). 1962 October 24 - . 09:46 GMT - . Launch Site: Woomera. Launch Complex: Woomera LA2. LV Family: Lupus. Launch Vehicle: HAD. Aeronomy mission - . Nation: Australia. Agency: WRE. Apogee: 133 km (82 mi). 1962 November 13 - . 10:10 GMT - . Launch Site: Woomera. Launch Complex: Woomera LA2. Launch Pad: LA2 SL. Launch Vehicle: Skylark. Solar X-rays / Meteors / O3 Solar / aeronomy / chemica mission - . Nation: Australia. Agency: Royal Aerospace Establishment, WRE. Apogee: 206 km (128 mi). 1962 November 22 - . 01:11 GMT - . Launch Site: Woomera. Launch Complex: Woomera LA2. Launch Pad: LA2 SL. Launch Vehicle: Skylark. Test mission - . Nation: Australia. Agency: Royal Aerospace Establishment, WRE. Apogee: 114 km (70 mi). 1962 November 27 - . 10:17 GMT - . Launch Site: Woomera. Launch Complex: Woomera LA2. LV Family: Lupus. Launch Vehicle: HAD. Aeronomy mission - . Nation: Australia. Agency: WRE. Apogee: 113 km (70 mi). 1962 November 28 - . 10:17 GMT - . Launch Site: Woomera. Launch Complex: Woomera LA2. Launch Pad: LA2 SL. Launch Vehicle: Skylark. Grenade / Chaff Aeronomy mission - . Nation: Australia. Agency: Royal Aerospace Establishment, WRE. Apogee: 230 km (140 mi). 1962 November 29 - . 16:33 GMT - . Launch Site: Woomera. Launch Complex: Woomera LA5B. Launch Pad: LA5A. Launch Vehicle: Black Knight. Gaslight Re-entry Vehicle test - . Nation: UK. Agency: Royal Aerospace Establishment. Apogee: 576 km (357 mi). 1962 December 4 - . 07:56 GMT - . Launch Site: Woomera. Launch Complex: Woomera LA2. Launch Pad: LA2 SL. Launch Vehicle: Skylark. Grenade / Chaff Aeronomy mission - . Nation: Australia. Agency: Royal Aerospace Establishment, WRE. Apogee: 105 km (65 mi). 1962 December 4 - . 10:28 GMT - . Launch Site: Woomera. Launch Complex: Woomera LA2. LV Family: Lupus. Launch Vehicle: HAD. 1963 January 30 - . 10:32 GMT - . Launch Site: Woomera. Launch Complex: Woomera LA2. LV Family: Lupus. Launch Vehicle: HAD. Aeronomy mission - . Nation: Australia. Agency: WRE. Apogee: 94 km (58 mi). 1963 March 1 - . 01:20 GMT - . Launch Site: Woomera. Launch Complex: Woomera LA2. Launch Pad: LA2 SL. Launch Vehicle: Skylark. XR / La / RF / CW / SpE Ionosphere / solar x-rays mission - . Nation: Australia. Agency: Royal Aerospace Establishment, WRE. Apogee: 209 km (129 mi). 1963 March 11 - . 04:30 GMT - . Launch Site: Woomera. Launch Complex: Woomera LA2. Launch Pad: LA2 SL. Launch Vehicle: Skylark. 1963 March 12 - . 09:50 GMT - . Launch Site: Woomera. Launch Complex: Woomera LA2. LV Family: Lupus. Launch Vehicle: HAD. Aeronomy mission - . Nation: Australia. Agency: WRE. Apogee: 124 km (77 mi). 1963 March 27 - . Launch Site: Woomera. Launch Complex: Woomera LA2. Launch Pad: LA2 HRV. LV Family: Rook. Launch Vehicle: Jaguar 1. 1963 March 28 - . 09:30 GMT - . Launch Site: Woomera. Launch Complex: Woomera LA2. LV Family: Lupus. Launch Vehicle: HAD. 1963 April 17 - . 09:23 GMT - . Launch Site: Woomera. Launch Complex: Woomera LA2. Launch Pad: LA2 SL. Launch Vehicle: Skylark. Grenade / Sphere / Sodium release Aeronomy mission - . Nation: Australia. Agency: Royal Aerospace Establishment, WRE. Apogee: 236 km (146 mi). 1963 May 23 - . 08:46 GMT - . Launch Site: Woomera. Launch Complex: Woomera LA2. Launch Pad: LA2 SL. Launch Vehicle: Skylark. XR / Ozone / Meteors Solar x-ray / aeronomy mission - . Nation: Australia. Agency: Royal Aerospace Establishment, WRE. Apogee: 201 km (124 mi). 1963 May 29 - . 04:35 GMT - . Launch Site: Woomera. Launch Complex: Woomera LA2. Launch Pad: LA2 SL. Launch Vehicle: Skylark. LF / Resonance / SpE / XR Ionosphere / solar x-rays mission - . Nation: Australia. Agency: Royal Aerospace Establishment, WRE. Apogee: 209 km (129 mi). 1963 June 18 - . 04:30 GMT - . Launch Site: Woomera. LV Family: Long Tom. Launch Vehicle: HAT. Ionosphere mission - . Nation: Australia. Agency: WRE. Apogee: 88 km (54 mi). 1963 June 18 - . 04:30 GMT - . Launch Site: Woomera. Launch Complex: Woomera LA2. Launch Pad: LA2 SL. Launch Vehicle: Skylark. LF / Resonance / SpE / XR Ionosphere / solar x-rays mission - . Nation: Australia. Agency: Royal Aerospace Establishment, WRE. Apogee: 196 km (121 mi). 1963 June 20 - . 05:20 GMT - . Launch Site: Woomera. Launch Complex: Woomera LA2. Launch Pad: LA2 SL. Launch Vehicle: Skylark. LangP / Te / La / SpE / XR Ionosphere / solar x-rays mission - . Nation: Australia. Agency: Royal Aerospace Establishment, WRE. Apogee: 227 km (141 mi). 1963 July 25 - . 04:59 GMT - . Launch Site: Woomera. Launch Complex: Woomera LA2. Launch Pad: LA2 SL. Launch Vehicle: Skylark. FAILURE: Failure. Test mission - . Nation: Australia. Agency: Royal Aerospace Establishment, WRE. Apogee: 0 km (0 mi). 1963 August 2 - . 02:30 GMT - . Launch Site: Woomera. Launch Complex: Woomera LA2. Launch Pad: LA2 SL. Launch Vehicle: Skylark. FAILURE: Failure. 1963 September 5 - . 03:41 GMT - . Launch Site: Woomera. Launch Complex: Woomera LA2. Launch Pad: LA2 SL. Launch Vehicle: Skylark. Test mission - . Nation: Australia. Agency: Royal Aerospace Establishment, WRE. Apogee: 214 km (132 mi). 1963 October 2 - . 15:10 GMT - . Launch Site: Woomera. Launch Complex: Woomera LA2. Launch Pad: LA2 SL. Launch Vehicle: Skylark. Antenna test / SpE Ionosphere mission - . Nation: Australia. Agency: Royal Aerospace Establishment, WRE. Apogee: 148 km (91 mi). 1963 October 15 - . 09:51 GMT - . Launch Site: Woomera. Launch Complex: Woomera LA2. Launch Pad: LA2 SL. Launch Vehicle: Skylark. Grenades / Sodium release / Sphere Aeronomy mission - . Nation: Australia. Agency: Royal Aerospace Establishment, WRE. Apogee: 210 km (130 mi). 1963 October 15 - . 11:48 GMT - . Launch Site: Woomera. Launch Complex: Woomera LA2. Launch Pad: LA2 SL. Launch Vehicle: Skylark. Grenade / Chaff Aeronomy mission - . Nation: Australia. Agency: Royal Aerospace Establishment, WRE. Apogee: 139 km (86 mi). 1963 October 15 - . 15:09 GMT - . Launch Site: Woomera. LV Family: Long Tom. Launch Vehicle: HAT. Aeronomy mission - . Nation: Australia. Agency: WRE. Apogee: 80 km (49 mi). 1963 October 15 - . 15:09 GMT - . Launch Site: Woomera. Launch Complex: Woomera LA2. Launch Pad: LA2 SL. Launch Vehicle: Skylark. Grenade / Chaff Aeronomy mission - . Nation: Australia. Agency: Royal Aerospace Establishment, WRE. Apogee: 140 km (80 mi). 1963 October 15 - . 19:22 GMT - . Launch Site: Woomera. Launch Complex: Woomera LA2. Launch Pad: LA2 SL. Launch Vehicle: Skylark. Grenades / Sodium release / Sphere Aeronomy mission - . Nation: Australia. Agency: Royal Aerospace Establishment, WRE. Apogee: 180 km (110 mi). 1963 October 15 - . 19:22 GMT - . Launch Site: Woomera. LV Family: Long Tom. Launch Vehicle: HAT. 1963 October 17 - . 10:52 GMT - . Launch Site: Woomera. Launch Complex: Woomera LA5B. Launch Pad: LA5B?. Launch Vehicle: Black Knight. Blue Streak test - . Nation: Europe. Agency: ELDO, Royal Aerospace Establishment. Apogee: 527 km (327 mi). 1963 October 30 - . 14:26 GMT - . Launch Site: Woomera. Launch Complex: Woomera LA2. Launch Pad: LA2 SL. Launch Vehicle: Skylark. Test mission - . Nation: Australia. Agency: Royal Aerospace Establishment, WRE. Apogee: 186 km (115 mi). 1963 November 19 - . 00:05 GMT - . Launch Site: Woomera. Launch Complex: Woomera LA2. Launch Pad: LA2 SL. Launch Vehicle: Skylark. FAILURE: Failure. CW / SpE / La / RF / XR Ionosphere / solar x-rays mission - . Nation: Australia. Agency: Royal Aerospace Establishment, WRE. Apogee: 0 km (0 mi). 1963 December 2 - . 04:15 GMT - . Launch Site: Woomera. Launch Complex: Woomera LA2. Launch Pad: LA2 SL. Launch Vehicle: Skylark. Test mission - . Nation: Australia. Agency: Royal Aerospace Establishment, WRE. Apogee: 168 km (104 mi). 1963 December 3 - . 04:59 GMT - . Launch Site: Woomera. Launch Complex: Woomera LA2. Launch Pad: LA2 SL. Launch Vehicle: Skylark. FAILURE: Failure. CW / SpE / La / RF / XR Ionosphere / solar x-rays mission - . Nation: Australia. Agency: Royal Aerospace Establishment, WRE. Apogee: 106 km (65 mi). 1963 December 6 - . 23:40 GMT - . Launch Site: Woomera. Launch Complex: Woomera LA2. LV Family: Lupus. Launch Vehicle: HAD. Ultraviolet absorption Solar extreme ultraviolet / aeronomy mission - . Nation: Australia. Agency: WRE. Apogee: 54 km (33 mi). 1963 December 12 - . 19:06 GMT - . Launch Site: Woomera. Launch Complex: Woomera LA2. LV Family: Lupus. Launch Vehicle: HAD. Aeronomy mission - . Nation: Australia. Agency: WRE. Apogee: 100 km (60 mi). 1964 - . Launch Site: Woomera. LV Family: FFAR. Launch Vehicle: HAEC. Test - . Nation: Australia. Agency: WRE. Apogee: 45 km (27 mi). 1964 - . Launch Site: Woomera. Launch Complex: Woomera LA1. Launch Vehicle: Long Tom. 1964 February 4 - . 01:05 GMT - . Launch Site: Woomera. Launch Complex: Woomera LA2. Launch Pad: LA2 SL. Launch Vehicle: Skylark. Aeronomy mission - . Nation: Australia. Agency: Royal Aerospace Establishment, WRE. Apogee: 118 km (73 mi). 1964 February 12 - . Launch Site: Woomera. Launch Complex: Woomera LA2. Launch Pad: LA2 HRV. LV Family: Rook. Launch Vehicle: Jaguar 1. 1964 February 12 - . 09:46 GMT - . Launch Site: Woomera. Launch Complex: Woomera LA2. LV Family: Lupus. Launch Vehicle: HAD. Aeronomy mission - . Nation: Australia. Agency: WRE. Apogee: 75 km (46 mi). 1964 February 20 - . 03:00 GMT - . Launch Site: Woomera. Launch Complex: Woomera LA2. Launch Pad: LA2 SL. Launch Vehicle: Skylark. FAILURE: Failure. Test mission - . Nation: Australia. Agency: Royal Aerospace Establishment, WRE. Apogee: 112 km (69 mi). 1964 March 4 - . 09:53 GMT - . Launch Site: Woomera. Launch Complex: Woomera LA2. LV Family: Lupus. Launch Vehicle: HAD. Aeronomy mission - . Nation: Australia. Agency: WRE. Apogee: 111 km (68 mi). 1964 March 10 - . 02:06 GMT - . Launch Site: Woomera. Launch Complex: Woomera LA2. Launch Pad: LA2 SL. Launch Vehicle: Skylark. Gamma / B / Solar X-rays / SpE Gamma ray astronomy mission - . Nation: Australia. Agency: Royal Aerospace Establishment, WRE. Apogee: 175 km (108 mi). 1964 March 11 - . Launch Site: Woomera. Launch Complex: Woomera LA5B. Launch Pad: LA5B?. Launch Vehicle: Black Knight. Dazzle re-entry vehicle test - . Nation: UK. Agency: Royal Aerospace Establishment. Apogee: 500 km (310 mi). 1964 March 12 - . 02:07 GMT - . Launch Site: Woomera. Launch Complex: Woomera LA2. Launch Pad: LA2 SL. Launch Vehicle: Skylark. Gamma / B / Solar X-rays / SpE Gamma ray astronomy mission - . Nation: Australia. Agency: Royal Aerospace Establishment, WRE. Apogee: 176 km (109 mi). 1964 April 11 - . 09:19 GMT - . Launch Site: Woomera. Launch Complex: Woomera LA2. Launch Pad: LA2 SL. Launch Vehicle: Skylark. Ozone distribution Aeronomy mission - . Nation: Australia. Agency: Royal Aerospace Establishment, WRE. Apogee: 200 km (120 mi). 1964 April 14 - . 08:32 GMT - . Launch Site: Woomera. Launch Complex: Woomera LA2. LV Family: Lupus. Launch Vehicle: HAD. Aeronomy mission - . Nation: Australia. Agency: WRE. Apogee: 121 km (75 mi). 1964 May 14 - . 04:31 GMT - . Launch Site: Woomera. Launch Complex: Woomera LA2. Launch Pad: LA2 SL. Launch Vehicle: Skylark. Test mission - . Nation: Australia. Agency: Royal Aerospace Establishment, WRE. Apogee: 182 km (113 mi). 1964 May 14 - . 08:37 GMT - . Launch Site: Woomera. Launch Complex: Woomera LA2. LV Family: Lupus. Launch Vehicle: HAD. Aeronomy mission - . Nation: Australia. Agency: WRE. Apogee: 88 km (54 mi). 1964 June 11 - . 08:31 GMT - . Launch Site: Woomera. Launch Complex: Woomera LA2. LV Family: Lupus. Launch Vehicle: HAD. 1964 Q3 - . Launch Site: Woomera. Launch Complex: Woomera LA2. Launch Vehicle: Aero High. FAILURE: Failure. Test mission - . Nation: Australia. Agency: WRE. Apogee: 0 km (0 mi). 1964 July 9 - . 08:39 GMT - . Launch Site: Woomera. Launch Complex: Woomera LA2. LV Family: Lupus. Launch Vehicle: HAD. 1964 July 13 - . 03:04 GMT - . Launch Site: Woomera. Launch Complex: Woomera LA2. LV Family: Lupus. Launch Vehicle: HAD. Aeronomy mission - . Nation: Australia. Agency: WRE. Apogee: 122 km (75 mi). 1964 July 14 - . 03:00 GMT - . Launch Site: Woomera. Launch Complex: Woomera LA2. LV Family: Lupus. Launch Vehicle: HAD. 1964 July 15 - . 00:47 GMT - . Launch Site: Woomera. Launch Complex: Woomera LA2. Launch Pad: LA2 SL. Launch Vehicle: Skylark. Test mission - . Nation: Australia. Agency: Royal Aerospace Establishment, WRE. Apogee: 81 km (50 mi). 1964 July 15 - . 02:19 GMT - . Launch Site: Woomera. Launch Complex: Woomera LA2. LV Family: Lupus. Launch Vehicle: HAD. Aeronomy mission - . Nation: Australia. Agency: WRE. Apogee: 106 km (65 mi). 1964 July 16 - . 02:13 GMT - . Launch Site: Woomera. Launch Complex: Woomera LA2. LV Family: Lupus. Launch Vehicle: HAD. 1964 July 17 - . 04:35 GMT - . Launch Site: Woomera. Launch Complex: Woomera LA2. Launch Pad: LA2 SL. Launch Vehicle: Skylark. Test mission - . Nation: Australia. Agency: Royal Aerospace Establishment, WRE. Apogee: 90 km (55 mi). 1964 August 5 - . 17:15 GMT - . Launch Site: Woomera. Launch Complex: Woomera LA5B. Launch Pad: LA5B?. Launch Vehicle: Black Knight. Dazzle re-entry vehicle test - . Nation: UK. Agency: Royal Aerospace Establishment. Apogee: 602 km (374 mi). 1964 August 11 - . 05:10 GMT - . Launch Site: Woomera. Launch Complex: Woomera LA2. Launch Pad: LA2 SL. Launch Vehicle: Skylark. LUX Solar AC1 Solar x-ray and ultraviolet mission - . Nation: Australia. Agency: Royal Aerospace Establishment, WRE. Apogee: 145 km (90 mi). 1964 August 20 - . 05:36 GMT - . Launch Site: Woomera. Launch Complex: Woomera LA2. Launch Pad: LA2 SL. Launch Vehicle: Skylark. X-ray pinhole / ne Ionosphere / solar x-rays mission - . Nation: Australia. Agency: Royal Aerospace Establishment, WRE. Apogee: 192 km (119 mi). 1964 August 20 - . 09:02 GMT - . Launch Site: Woomera. Launch Complex: Woomera LA2. LV Family: Lupus. Launch Vehicle: HAD. Aeronomy mission - . Nation: Australia. Agency: WRE. Apogee: 119 km (73 mi). 1964 September 1 - . 09:19 GMT - . Launch Site: Woomera. Launch Complex: Woomera LA2. Launch Pad: LA2 SL. Launch Vehicle: Skylark. Ozone distribution Aeronomy mission - . Nation: Australia. Agency: Royal Aerospace Establishment, WRE. Apogee: 212 km (131 mi). 1964 September 4 - . 01:20 GMT - . Launch Site: Woomera. Launch Complex: Woomera LA2. Launch Pad: LA2 SL. Launch Vehicle: Skylark. FAILURE: Failure. 1964 September 17 - . 05:56 GMT - . Launch Site: Woomera. Launch Complex: Woomera LA2. Launch Pad: LA2 SL. Launch Vehicle: Skylark. 1964 September 17 - . 09:17 GMT - . Launch Site: Woomera. Launch Complex: Woomera LA2. LV Family: Lupus. Launch Vehicle: HAD. Aeronomy mission - . Nation: Australia. Agency: WRE. Apogee: 99 km (61 mi). 1964 September 24 - . 04:42 GMT - . Launch Site: Woomera. Launch Complex: Woomera LA2. Launch Pad: LA2 SL. Launch Vehicle: Skylark. Plasma / Solar X Ionosphere / solar x-rays mission - . Nation: Australia. Agency: Royal Aerospace Establishment, WRE. Apogee: 180 km (110 mi). 1964 September 29 - . 04:31 GMT - . Launch Site: Woomera. Launch Complex: Woomera LA2. Launch Pad: LA2 SL. Launch Vehicle: Skylark. Ionosphere / solar x-rays mission - . Nation: Australia. Agency: Royal Aerospace Establishment, WRE. Apogee: 174 km (108 mi). 1964 October 2 - . Launch Site: Woomera. Launch Complex: Woomera LA2. Launch Pad: LA2 HRV. LV Family: Rook. Launch Vehicle: Jabiru 2. Test mission - . Nation: UK. Agency: Royal Aerospace Establishment. Apogee: 30 km (18 mi). 1964 October 14 - . 09:36 GMT - . Launch Site: Woomera. Launch Complex: Woomera LA2. LV Family: Lupus. Launch Vehicle: HAD. Aeronomy mission - . Nation: Australia. Agency: WRE. Apogee: 102 km (63 mi). 1964 October 27 - . 10:50 GMT - . Launch Site: Woomera. Launch Complex: Woomera LA2. Launch Pad: LA2 SL. Launch Vehicle: Skylark. XRB / SpE / Stellar UV Ultraviolet / x-ray astronomy mission - . Nation: Australia. Agency: Royal Aerospace Establishment, WRE. Apogee: 146 km (90 mi). 1964 November 6 - . 13:45 GMT - . Launch Site: Woomera. Launch Complex: Woomera LA5B. Launch Pad: LA5B?. Launch Vehicle: Black Knight. Dazzle re-entry vehicle test - . Nation: UK. Agency: Royal Aerospace Establishment. Apogee: 629 km (390 mi). 1964 November 11 - . 09:59 GMT - . Launch Site: Woomera. Launch Complex: Woomera LA2. LV Family: Lupus. Launch Vehicle: HAD. 1964 November 12 - . 10:00 GMT - . Launch Site: Woomera. Launch Complex: Woomera LA2. LV Family: Lupus. Launch Vehicle: HAD. Aeronomy mission - . Nation: Australia. Agency: WRE. Apogee: 103 km (64 mi). 1964 December 8 - . 10:26 GMT - . Launch Site: Woomera. Launch Complex: Woomera LA2. LV Family: Lupus. Launch Vehicle: HAD. 1964 December 10 - . 10:26 GMT - . Launch Site: Woomera. Launch Complex: Woomera LA2. LV Family: Lupus. Launch Vehicle: HAD. 1964 December 16 - . 02:02 GMT - . Launch Site: Woomera. Launch Complex: Woomera LA2. Launch Pad: LA2 SL. LV Family: Skylark. Launch Vehicle: Skylark 3. Test mission - . Nation: Australia. Agency: Royal Aerospace Establishment, WRE. Apogee: 220 km (130 mi). 1964 December 17 - . 03:05 GMT - . Launch Site: Woomera. Launch Complex: Woomera LA2. Launch Pad: LA2 SL. Launch Vehicle: Skylark. LUX Solar AC2 Solar x-ray and ultraviolet mission - . Nation: Australia. Agency: Royal Aerospace Establishment, WRE. Apogee: 167 km (103 mi). 1965 - . Launch Site: Woomera. LV Family: FFAR. Launch Vehicle: HAEC. 1965 February 2 - . 09:57 GMT - . Launch Site: Woomera. Launch Complex: Woomera LA2. LV Family: Lupus. Launch Vehicle: HAD. Aeronomy mission - . Nation: Australia. Agency: WRE. Apogee: 123 km (76 mi). 1965 February 3 - . 22:55 GMT - . Launch Site: Woomera. Launch Complex: Woomera LA2. LV Family: Lupus. Launch Vehicle: HAD. La absorption Aeronomy mission - . Nation: Australia. Agency: WRE. Apogee: 100 km (60 mi). 1965 March 3 - . 04:42 GMT - . Launch Site: Woomera. Launch Complex: Woomera LA2. Launch Pad: LA2 SL. LV Family: Skylark. Launch Vehicle: Skylark 3. Test mission - . Nation: Australia. Agency: Royal Aerospace Establishment, WRE. Apogee: 216 km (134 mi). 1965 March 17 - . 18:08 GMT - . Launch Site: Woomera. Launch Complex: Woomera LA2. Launch Pad: LA2 SL. Launch Vehicle: Skylark. FAILURE: Failure. Stellar ultraviolet / Antenna Ultraviolet astronomy mission - . Nation: Australia. Agency: Royal Aerospace Establishment, WRE. Apogee: 19 km (11 mi). 1965 March 25 - . 00:06 GMT - . Launch Site: Woomera. Launch Complex: Woomera LA2. Launch Pad: LA2 SL. Launch Vehicle: Skylark. Stellar ultraviolet / Antenna Ultraviolet astronomy / ionosphere mission - . Nation: Australia. Agency: Royal Aerospace Establishment, WRE. Apogee: 174 km (108 mi). 1965 March 30 - . 09:30 GMT - . Launch Site: Woomera. Launch Complex: Woomera LA2. LV Family: Lupus. Launch Vehicle: HAD. Aeronomy mission - . Nation: Australia. Agency: WRE. Apogee: 112 km (69 mi). 1965 April 9 - . 01:01 GMT - . Launch Site: Woomera. Launch Complex: Woomera LA2. Launch Pad: LA2 SL. Launch Vehicle: Skylark. LUX Solar AC3 Solar x-ray and ultraviolet mission - . Nation: Australia. Agency: Royal Aerospace Establishment, WRE. Apogee: 160 km (90 mi). 1965 April 21 - . 11:02 GMT - . Launch Site: Woomera. Launch Complex: Woomera LA5B. Launch Pad: LA5B?. Launch Vehicle: Black Knight. Dazzle re-entry vehicle test - . Nation: UK. Agency: Royal Aerospace Establishment. Apogee: 651 km (404 mi). 1965 April 29 - . 09:03 GMT - . Launch Site: Woomera. Launch Complex: Woomera LA2. Launch Pad: LA2 SL. Launch Vehicle: Skylark. FAILURE: Failure. Grenades / Chaff / Lithium release Aeronomy mission - . Nation: Australia. Agency: Royal Aerospace Establishment, WRE. Apogee: 140 km (80 mi). 1965 April 29 - . 11:09 GMT - . Launch Site: Woomera. Launch Complex: Woomera LA2. Launch Pad: LA2 SL. Launch Vehicle: Skylark. Grenades Aeronomy mission - . Nation: Australia. Agency: Royal Aerospace Establishment, WRE. Apogee: 136 km (84 mi). 1965 April 29 - . 12:25 GMT - . Launch Site: Woomera. Launch Complex: Woomera LA2. Launch Pad: LA2 SL. Launch Vehicle: Skylark. Grenades Aeronomy mission - . Nation: Australia. Agency: Royal Aerospace Establishment, WRE. Apogee: 132 km (82 mi). 1965 April 29 - . 13:56 GMT - . Launch Site: Woomera. Launch Complex: Woomera LA2. Launch Pad: LA2 SL. Launch Vehicle: Skylark. Grenades Aeronomy mission - . Nation: Australia. Agency: Royal Aerospace Establishment, WRE. Apogee: 124 km (77 mi). 1965 April 29 - . 16:19 GMT - . Launch Site: Woomera. Launch Complex: Woomera LA2. Launch Pad: LA2 SL. Launch Vehicle: Skylark. Grenades Aeronomy mission - . Nation: Australia. Agency: Royal Aerospace Establishment, WRE. Apogee: 140 km (80 mi). 1965 April 29 - . 17:56 GMT - . Launch Site: Woomera. Launch Complex: Woomera LA2. Launch Pad: LA2 SL. Launch Vehicle: Skylark. Grenades Aeronomy mission - . Nation: Australia. Agency: Royal Aerospace Establishment, WRE. Apogee: 135 km (83 mi). 1965 April 29 - . 20:40 GMT - . Launch Site: Woomera. Launch Complex: Woomera LA2. Launch Pad: LA2 SL. Launch Vehicle: Skylark. Grenades / Sphere Aeronomy mission - . Nation: Australia. Agency: Royal Aerospace Establishment, WRE. Apogee: 175 km (108 mi). 1965 May 11 - . 08:39 GMT - . Launch Site: Woomera. Launch Complex: Woomera LA2. LV Family: Lupus. Launch Vehicle: HAD. 1965 May 11 - . 20:40 GMT - . Launch Site: Woomera. Launch Complex: Woomera LA2. Launch Pad: LA2 SL. Launch Vehicle: Skylark. Sphere / Li Aeronomy mission - . Nation: Australia. Agency: Royal Aerospace Establishment, WRE. Apogee: 181 km (112 mi). 1965 May 13 - . 16:05 GMT - . Launch Site: Woomera. Launch Complex: Woomera LA2. Launch Pad: LA2 SL. Launch Vehicle: Skylark. Electron density Ionosphere mission - . Nation: Australia. Agency: Royal Aerospace Establishment, WRE. Apogee: 187 km (116 mi). 1965 May 19 - . 05:25 GMT - . Launch Site: Woomera. Launch Complex: Woomera LA2. Launch Pad: LA2 SL. Launch Vehicle: Skylark. Solar X-rays / Electron density Ionosphere / solar x-rays mission - . Nation: Australia. Agency: Royal Aerospace Establishment, WRE. Apogee: 179 km (111 mi). 1965 May 25 - . Launch Site: Woomera. Launch Complex: Woomera LA2. LV Family: Lupus. Launch Vehicle: HAD. Aeronomy mission - . Nation: Australia. Agency: WRE. Apogee: 110 km (60 mi). 1965 June 8 - . 08:31 GMT - . Launch Site: Woomera. Launch Complex: Woomera LA2. LV Family: Lupus. Launch Vehicle: HAD. 1965 June 9 - . 08:32 GMT - . Launch Site: Woomera. Launch Complex: Woomera LA2. LV Family: Lupus. Launch Vehicle: HAD. Aeronomy mission - . Nation: Australia. Agency: WRE. Apogee: 115 km (71 mi). 1965 July 1 - . 01:45 GMT - . Launch Site: Woomera. Launch Complex: Woomera LA2. Launch Pad: LA2 SL. Launch Vehicle: Skylark. Solar X-rays / Ionosphere Ionosphere / solar x-rays mission - . Nation: Australia. Agency: Royal Aerospace Establishment, WRE. Apogee: 130 km (80 mi). 1965 July 7 - . 08:37 GMT - . Launch Site: Woomera. Launch Complex: Woomera LA2. LV Family: Lupus. Launch Vehicle: HAD. Aeronomy mission - . Nation: Australia. Agency: WRE. Apogee: 105 km (65 mi). 1965 July 14 - . 11:08 GMT - . Launch Site: Woomera. Launch Complex: Woomera LA2. Launch Pad: LA2 SL. Launch Vehicle: Skylark. Stellar ultraviolet / Attitude Ultraviolet astronomy mission - . Nation: Australia. Agency: Royal Aerospace Establishment, WRE. Apogee: 182 km (113 mi). 1965 July 26 - . 17:00 GMT - . Launch Site: Woomera. Launch Complex: Woomera LA5B. Launch Pad: LA5B?. Launch Vehicle: Black Knight. Dazzle re-entry vehicle test - . Nation: UK. Agency: Royal Aerospace Establishment. Apogee: 492 km (305 mi). 1965 July 29 - . 01:15 GMT - . Launch Site: Woomera. Launch Complex: Woomera LA2. Launch Pad: LA2 SL. Launch Vehicle: Skylark. FAILURE: Failure. Solar X-rays / Ionosphere Ionosphere / solar x-rays mission - . Nation: Australia. Agency: Royal Aerospace Establishment, WRE. Apogee: 0 km (0 mi). 1965 August 3 - . 08:52 GMT - . Launch Site: Woomera. Launch Complex: Woomera LA2. LV Family: Lupus. Launch Vehicle: HAD. 1965 August 25 - . Launch Site: Woomera. Launch Complex: Woomera LA2. Launch Pad: LA2 HRV. LV Family: Rook. Launch Vehicle: Jabiru 2. 1965 September 9 - . 04:20 GMT - . Launch Site: Woomera. Launch Complex: Woomera LA2. Launch Pad: LA2 SL. LV Family: Skylark. Launch Vehicle: Skylark 3. Test mission - . Nation: Australia. Agency: Royal Aerospace Establishment, WRE. Apogee: 221 km (137 mi). 1965 September 28 - . 14:35 GMT - . Launch Site: Woomera. Launch Complex: Woomera LA5B. Launch Pad: LA5B?. Launch Vehicle: Black Knight. Dazzle re-entry vehicle test - . Nation: UK. Agency: Royal Aerospace Establishment. Apogee: 605 km (375 mi). 1965 October 5 - . 09:27 GMT - . Launch Site: Woomera. Launch Complex: Woomera LA2. LV Family: Lupus. Launch Vehicle: HAD. 1965 October 18 - . 11:23 GMT - . Launch Site: Woomera. Launch Complex: Woomera LA2. Launch Pad: LA2 SL. Launch Vehicle: Skylark. Airglow Aeronomy mission - . Nation: Australia. Agency: Royal Aerospace Establishment, WRE. Apogee: 205 km (127 mi). 1965 October 20 - . 05:20 GMT - . Launch Site: Woomera. Launch Complex: Woomera LA2. Launch Pad: LA2 SL. LV Family: Skylark. Launch Vehicle: Skylark 3 AC. LUX Solar AC4 Solar x-ray and ultraviolet mission - . Nation: Australia. Agency: Royal Aerospace Establishment, WRE. Apogee: 214 km (132 mi). 1965 November 9 - . 09:58 GMT - . Launch Site: Woomera. Launch Complex: Woomera LA2. LV Family: Lupus. Launch Vehicle: HAD. 1965 November 19 - . 04:54 GMT - . Launch Site: Woomera. Launch Complex: Woomera LA2. Launch Pad: LA2 SL. Launch Vehicle: Skylark. Solar X-rays / SpE / Li Ionosphere / solar x-rays mission - . Nation: Australia. Agency: Royal Aerospace Establishment, WRE. Apogee: 138 km (85 mi). 1965 November 25 - . 13:20 GMT - . Launch Site: Woomera. Launch Complex: Woomera LA5B. Launch Pad: LA5B?. Launch Vehicle: Black Knight. Dazzle re-entry vehicle test - . Nation: UK. Agency: Royal Aerospace Establishment. Apogee: 632 km (392 mi). 1965 December 6 - . 10:24 GMT - . Launch Site: Woomera. Launch Complex: Woomera LA2. LV Family: Lupus. Launch Vehicle: HAD. 1965 December 9 - . 13:05 GMT - . Launch Site: Woomera. Launch Complex: Woomera LA2. LV Family: Lupus. Launch Vehicle: HAD. Lunar ultraviolet Ozone Ultraviolet astronomy / aeronomy mission - . Nation: Australia. Agency: WRE. Apogee: 85 km (52 mi). 1965 December 13 - . 10:08 GMT - . Launch Site: Woomera. Launch Complex: Woomera LA2. Launch Pad: LA2 SL. Launch Vehicle: Skylark. Solar X-rays / SpE / Li Ionosphere / solar x-rays mission - . Nation: Australia. Agency: Royal Aerospace Establishment, WRE. Apogee: 130 km (80 mi). 1966 - . Launch Site: Woomera. LV Family: FFAR. Launch Vehicle: HAEC. 1966 January 26 - . 10:32 GMT - . Launch Site: Woomera. Launch Complex: Woomera LA2. LV Family: Lupus. Launch Vehicle: HAD. 1966 February 2 - . 23:15 GMT - . Launch Site: Woomera. Launch Complex: Woomera LA2. Launch Pad: LA2 SL. LV Family: Skylark. Launch Vehicle: Skylark 3 AC. LUX Solar AC5 Solar x-ray and ultraviolet mission - . Nation: Australia. Agency: Royal Aerospace Establishment, WRE. Apogee: 216 km (134 mi). 1966 February 23 - . 10:06 GMT - . Launch Site: Woomera. Launch Complex: Woomera LA2. LV Family: Lupus. Launch Vehicle: HAD. 1966 March 16 - . 23:50 GMT - . Launch Site: Woomera. Launch Complex: Woomera LA2. Launch Pad: LA2 SL. LV Family: Skylark. Launch Vehicle: Skylark 3. 1966 March 22 - . 09:38 GMT - . Launch Site: Woomera. Launch Complex: Woomera LA2. LV Family: Lupus. Launch Vehicle: HAD. 1966 April 20 - . 02:30 GMT - . Launch Site: Woomera. Launch Complex: Woomera LA2. Launch Pad: LA2 SL. LV Family: Skylark. Launch Vehicle: Skylark 2. Test mission - . Nation: Australia. Agency: Royal Aerospace Establishment, WRE. Apogee: 172 km (106 mi). 1966 April 21 - . 00:06 GMT - . Launch Site: Woomera. Launch Complex: Woomera LA2. Launch Pad: LA2 SL. LV Family: Skylark. Launch Vehicle: Skylark 2. Test mission - . Nation: Australia. Agency: Royal Aerospace Establishment, WRE. Apogee: 193 km (119 mi). 1966 May 5 - . 04:14 GMT - . Launch Site: Woomera. Launch Complex: Woomera LA2. Launch Pad: LA2 SL. LV Family: Skylark. Launch Vehicle: Skylark 3 AC. Solar X-rays / La / Cell test Solar x-ray and ultraviolet mission - . Nation: Australia. Agency: Royal Aerospace Establishment, WRE. Apogee: 203 km (126 mi). 1966 May 17 - . 08:42 GMT - . Launch Site: Woomera. Launch Complex: Woomera LA2. LV Family: Lupus. Launch Vehicle: HAD. 1966 May 31 - . 19:19 GMT - . Launch Site: Woomera. Launch Complex: Woomera LA2. Launch Pad: LA2 SL. Launch Vehicle: Skylark. Antenna / Plasma waves Ionosphere mission - . Nation: Australia. Agency: Royal Aerospace Establishment, WRE. Apogee: 161 km (100 mi). 1966 June 2 - . 08:34 GMT - . Launch Site: Woomera. Launch Complex: Woomera LA2. Launch Pad: LA2 SL. Launch Vehicle: Skylark. Solar ultraviolet / Ozone Aeronomy / solar ultraviolet mission - . Nation: Australia. Agency: Royal Aerospace Establishment, WRE. Apogee: 176 km (109 mi). 1966 June 9 - . 08:33 GMT - . Launch Site: Woomera. Launch Complex: Woomera LA2. Launch Pad: LA2 SL. Launch Vehicle: Skylark. Solar ultraviolet / Ozone Aeronomy / solar ultraviolet mission - . Nation: Australia. Agency: Royal Aerospace Establishment, WRE. Apogee: 184 km (114 mi). 1966 June 15 - . 08:35 GMT - . Launch Site: Woomera. Launch Complex: Woomera LA2. LV Family: Lupus. Launch Vehicle: HAD. 1966 June 23 - . 01:38 GMT - . Launch Site: Woomera. Launch Complex: Woomera LA2. Launch Pad: LA2 SL. Launch Vehicle: Skylark. Antenna / Plasma waves Ionosphere mission - . Nation: Australia. Agency: Royal Aerospace Establishment, WRE. Apogee: 170 km (100 mi). 1966 July 19 - . 08:48 GMT - . Launch Site: Woomera. Launch Complex: Woomera LA2. LV Family: Lupus. Launch Vehicle: HAD. 1966 July 28 - . 00:51 GMT - . Launch Site: Woomera. Launch Complex: Woomera LA2. Launch Pad: LA2 SL. LV Family: Skylark. Launch Vehicle: Skylark 3. Test mission - . Nation: Australia. Agency: Royal Aerospace Establishment, WRE. Apogee: 213 km (132 mi). 1966 August 10 - . Launch Site: Woomera. Launch Complex: Woomera LA2 HRV. LV Family: Rook. Launch Vehicle: Jabiru 2. HRV 923/UK-D - . Nation: Australia. Agency: Royal Aerospace Establishment. Apogee: 250 km (150 mi). 1966 August 28 - . 09:04 GMT - . Launch Site: Woomera. Launch Complex: Woomera LA2. LV Family: Lupus. Launch Vehicle: HAD. 1966 August 30 - . 10:05 GMT - . Launch Site: Woomera. Launch Complex: Woomera LA2. LV Family: Lupus. Launch Vehicle: HAD. Lunar ultraviolet Ozone Aeronomy mission - . Nation: Australia. Agency: WRE. Apogee: 91 km (56 mi). 1966 September 27 - . 09:22 GMT - . Launch Site: Woomera. Launch Complex: Woomera LA2. LV Family: Lupus. Launch Vehicle: HAD. 1966 October 25 - . 09:06 GMT - . Launch Site: Woomera. Launch Complex: Woomera LA2. Launch Pad: LA2 SL. Launch Vehicle: Skylark. Electron ne / T Ionosphere mission - . Nation: Australia. Agency: Royal Aerospace Establishment, WRE. Apogee: 211 km (131 mi). 1966 October 25 - . 11:11 GMT - . Launch Site: Woomera. Launch Complex: Woomera LA2. Launch Pad: LA2 SL. LV Family: Skylark. Launch Vehicle: Skylark 1. Electron ne / T Ionosphere mission - . Nation: Australia. Agency: Royal Aerospace Establishment, WRE. Apogee: 119 km (73 mi). 1966 October 27 - . 08:47 GMT - . Launch Site: Woomera. Launch Complex: Woomera LA2. Launch Pad: LA2 SL. Launch Vehicle: Skylark. Electron ne / T Ionosphere mission - . Nation: Australia. Agency: Royal Aerospace Establishment, WRE. Apogee: 173 km (107 mi). 1966 October 27 - . 10:25 GMT - . Launch Site: Woomera. Launch Complex: Woomera LA2. Launch Pad: LA2 SL. LV Family: Skylark. Launch Vehicle: Skylark 2. Electron ne / T Ionosphere mission - . Nation: Australia. Agency: Royal Aerospace Establishment, WRE. Apogee: 212 km (131 mi). 1966 October 27 - . 13:35 GMT - . Launch Site: Woomera. Launch Complex: Woomera LA2. Launch Pad: LA2 SL. Launch Vehicle: Skylark. Electron ne / T Ionosphere mission - . Nation: Australia. Agency: Royal Aerospace Establishment, WRE. Apogee: 200 km (120 mi). 1966 November 1 - . Launch Site: Woomera. Launch Complex: Woomera LA2. Launch Pad: LA2 HRV. LV Family: Rook. Launch Vehicle: Jabiru 2. 1966 November 1 - . 09:48 GMT - . Launch Site: Woomera. Launch Complex: Woomera LA2. LV Family: Lupus. Launch Vehicle: HAD. 1966 November 10 - . 22:35 GMT - . Launch Site: Woomera. Launch Complex: Woomera LA2. Launch Vehicle: Long Tom. Gosling flight Solar Ultraviolet mission - . Nation: Australia. Agency: WRE. Apogee: 100 km (60 mi). 1966 November 18 - . 01:05 GMT - . Launch Site: Woomera. Launch Complex: Woomera LA2. Launch Pad: LA2 SL. LV Family: Skylark. Launch Vehicle: Skylark 3 AC. FAILURE: Failure. Test mission - . Nation: Australia. Agency: Royal Aerospace Establishment, WRE. Apogee: 142 km (88 mi). 1966 December 8 - . 14:57 GMT - . Launch Site: Woomera. Launch Complex: Woomera LA2. Launch Pad: LA2 SL. LV Family: Skylark. Launch Vehicle: Skylark 3 AC. FAILURE: Failure. LUX / Culham Solar AC6 Solar x-ray and ultraviolet mission - . Nation: Australia. Agency: Royal Aerospace Establishment, WRE. Apogee: 0 km (0 mi). 1966 December 14 - . 06:33 GMT - . Launch Site: Woomera. Launch Complex: Woomera LA2. Launch Pad: LA2 SL. Launch Vehicle: Skylark. Test mission - . Nation: Australia. Agency: Royal Aerospace Establishment, WRE. Apogee: 164 km (101 mi). 1967 March 14 - . 06:00 GMT - . Launch Site: Woomera. Launch Complex: Woomera LA2. Launch Pad: LA2 SL. LV Family: Skylark. Launch Vehicle: Skylark 3 AC. LUX / Culham Solar AC7 Solar x-ray and ultraviolet mission - . Nation: Australia. Agency: Royal Aerospace Establishment, WRE. Apogee: 200 km (120 mi). 1967 April 4 - . 00:32 GMT - . Launch Site: Woomera. Launch Complex: Woomera LA2. Launch Pad: LA2 SL. LV Family: Skylark. Launch Vehicle: Skylark 3. X-ray survey / ne Solar x-ray / ionosphere mission - . Nation: Australia. Agency: Royal Aerospace Establishment, WRE. Apogee: 220 km (130 mi). 1967 April 10 - . 10:51 GMT - . Launch Site: Woomera. Launch Complex: Woomera LA2. Launch Pad: LA2 SL. Launch Vehicle: Skylark. X-ray survey / airglow X-ray astronomy mission - . Nation: Australia. Agency: Royal Aerospace Establishment, WRE. Apogee: 167 km (103 mi). 1967 April 12 - . 12:32 GMT - . Launch Site: Woomera. Launch Complex: Woomera LA2. Launch Pad: LA2 SL. Launch Vehicle: Skylark. X-ray survey / airglow X-ray astronomy mission - . Nation: Australia. Agency: Royal Aerospace Establishment, WRE. Apogee: 160 km (90 mi). 1967 April 20 - . 22:36 GMT - . Launch Site: Woomera. Launch Complex: Woomera LA2. Launch Pad: LA2 SL. LV Family: Skylark. Launch Vehicle: Skylark 3. X-ray survey / ne Solar x-ray / ionosphere mission - . Nation: Australia. Agency: Royal Aerospace Establishment, WRE. Apogee: 218 km (135 mi). 1967 April 27 - . 04:31 GMT - . Launch Site: Woomera. Launch Complex: Woomera LA2. Launch Pad: LA2 SL. LV Family: Skylark. Launch Vehicle: Skylark 3 AC. Test mission - . Nation: Australia. Agency: Royal Aerospace Establishment, WRE. Apogee: 203 km (126 mi). 1967 May 1 - . Launch Site: Woomera. Launch Complex: Woomera LA2. Launch Pad: LA2 HRV. Launch Vehicle: Rook. 1967 August 1 - . Launch Site: Woomera. Launch Complex: Woomera LA2. Launch Pad: LA2 HRV. LV Family: Rook. Launch Vehicle: Rook IIIA. Oberon 1 test - . Nation: UK. Agency: Royal Aerospace Establishment. Apogee: 20 km (12 mi). 1967 August 8 - . 03:28 GMT - . Launch Site: Woomera. Launch Complex: Woomera LA2. Launch Pad: LA2 SL. LV Family: Skylark. Launch Vehicle: Skylark 3 AC. Solar spectra Solar x-ray and ultraviolet mission - . Nation: Australia. Agency: Royal Aerospace Establishment, WRE. Apogee: 182 km (113 mi). 1967 August 16 - . 06:36 GMT - . Launch Site: Woomera. Launch Complex: Woomera LA2. Launch Pad: LA2 SL. Launch Vehicle: Skylark. Test mission - . Nation: Australia. Agency: Royal Aerospace Establishment, WRE. Apogee: 152 km (94 mi). 1967 August 24 - . 10:05 GMT - . Launch Site: Woomera. Launch Complex: Woomera LA2. Launch Pad: LA2 SL. Launch Vehicle: Skylark. Geocorona? Ultraviolet astronomy mission - . Nation: Australia. Agency: Royal Aerospace Establishment, WRE. Apogee: 178 km (110 mi). 1967 August 29 - . 10:01 GMT - . Launch Site: Woomera. Launch Complex: Woomera LA2. Launch Pad: LA2 SL. Launch Vehicle: Skylark. Geocorona? Ultraviolet astronomy mission - . Nation: Australia. Agency: Royal Aerospace Establishment, WRE. Apogee: 124 km (77 mi). 1967 November 1 - . 04:30 GMT - . Launch Site: Woomera. Launch Complex: Woomera LA2. Launch Pad: LA2 SL. LV Family: Skylark. Launch Vehicle: Skylark 3 AC. LUX / Culham Solar AC8 Solar x-ray and ultraviolet mission - . Nation: Australia. Agency: Royal Aerospace Establishment, WRE. Apogee: 209 km (129 mi). 1967 November 14 - . 05:27 GMT - . Launch Site: Woomera. Launch Complex: Woomera LA2. Launch Pad: LA2 SL. Launch Vehicle: Skylark. B field / Ultraviolet Abs Ionosphere mission - . Nation: Australia. Agency: Royal Aerospace Establishment, WRE. Apogee: 178 km (110 mi). 1967 November 17 - . Launch Site: Woomera. Launch Complex: Woomera LA2. Launch Pad: LA2 SL. Launch Vehicle: Skylark. 1967 December 1 - . Launch Site: Woomera. Launch Complex: Woomera LA1. LV Family: Lupus. Launch Vehicle: HAD. HAD-WRESAT - . Nation: Australia. Agency: WRE. Apogee: 100 km (60 mi). 1967 December 1 - . 06:08 GMT - . Launch Site: Woomera. Launch Complex: Woomera LA2. Launch Pad: LA2 SL. Launch Vehicle: Skylark. UK SL422A test - . Nation: Australia. Agency: Royal Aerospace Establishment, WRE. Apogee: 181 km (112 mi). 1967 December 7 - . Launch Site: Woomera. Launch Complex: Woomera LA2. Launch Pad: LA2 HRV. LV Family: Rook. Launch Vehicle: Jabiru 2. 1968 - . Launch Site: Woomera. Launch Complex: Woomera LA2. Launch Vehicle: Aero High. FAILURE: Failure. Aeronomy mission - . Nation: Australia. Agency: WRE. Apogee: 0 km (0 mi). 1968 - . Launch Site: Woomera. Launch Complex: Woomera LA1. LV Family: Long Tom. Launch Vehicle: HAT. Explorer 37 cal - . Nation: Australia. Agency: WRE. Apogee: 80 km (49 mi). 1968 February 8 - . 06:01 GMT - . Launch Site: Woomera. Launch Complex: Woomera LA2. Launch Pad: LA2 SL. LV Family: Skylark. Launch Vehicle: Skylark 6. UK SL583A test - . Nation: Australia. Agency: Royal Aerospace Establishment, WRE. Apogee: 300 km (180 mi). 1968 March 20 - . 04:57 GMT - . Launch Site: Woomera. Launch Complex: Woomera LA2. Launch Pad: LA2 SL. LV Family: Skylark. Launch Vehicle: Skylark 3. LUX / Culham Solar AC9 Solar x-ray and ultraviolet mission - . Nation: Australia. Agency: Royal Aerospace Establishment, WRE. Apogee: 217 km (134 mi). 1968 May 31 - . 08:49 GMT - . Launch Site: Woomera. Launch Complex: Woomera LA2. Launch Pad: LA2 SL. Launch Vehicle: Skylark. Grenades / TMA release Aeronomy mission - . Nation: Australia. Agency: Royal Aerospace Establishment, WRE. Apogee: 242 km (150 mi). 1968 May 31 - . 20:39 GMT - . Launch Site: Woomera. Launch Complex: Woomera LA2. Launch Pad: LA2 SL. Launch Vehicle: Skylark. Grenades / TMA release Aeronomy mission - . Nation: Australia. Agency: Royal Aerospace Establishment, WRE. Apogee: 238 km (147 mi). 1968 June 12 - . 10:30 GMT - . Launch Site: Woomera. Launch Complex: Woomera LA2. Launch Pad: LA2 SL. Launch Vehicle: Skylark. X-ray survey X-ray astronomy mission - . Nation: Australia. Agency: Royal Aerospace Establishment, WRE. Apogee: 184 km (114 mi). 1968 July 8 - . 06:05 GMT - . Launch Site: Woomera. Launch Complex: Woomera LA2. Launch Pad: LA2 SL. LV Family: Skylark. Launch Vehicle: Skylark 3 AC. Virgo X-ray X-ray astronomy mission - . Nation: Australia. Agency: Royal Aerospace Establishment, WRE. Apogee: 180 km (110 mi). 1968 July 18 - . Launch Site: Woomera. Launch Complex: Woomera LA2. Launch Pad: LA2 HRV. LV Family: Rook. Launch Vehicle: Jabiru 2. 1968 July 24 - . 01:41 GMT - . Launch Site: Woomera. Launch Complex: Woomera LA2. Launch Pad: LA2 SL. Launch Vehicle: Skylark. Electron profile Ionosphere mission - . Nation: Australia. Agency: Royal Aerospace Establishment, WRE. Apogee: 258 km (160 mi). 1968 August 6 - . 01:55 GMT - . Launch Site: Woomera. Launch Complex: Woomera LA2. Launch Pad: LA2 SL. Launch Vehicle: Skylark. Electron profile Ionosphere mission - . Nation: Australia. Agency: Royal Aerospace Establishment, WRE. Apogee: 234 km (145 mi). 1968 August 15 - . 02:23 GMT - . Launch Site: Woomera. Launch Vehicle: Skua. Met - . Nation: Australia. Agency: WRE. Apogee: 65 km (40 mi). 1968 August 16 - . 01:33 GMT - . Launch Site: Woomera. LV Family: Musca. Launch Vehicle: Kookaburra. Met - . Nation: Australia. Agency: WRE. Apogee: 74 km (45 mi). 1968 August 29 - . 19:43 GMT - . Launch Site: Woomera. Launch Complex: Woomera LA2. Launch Pad: LA2 SL. LV Family: Skylark. Launch Vehicle: Skylark 3 AC. UK SL501 Ionosphere / solar x-rays mission - . Nation: Australia. Agency: Royal Aerospace Establishment, WRE. Apogee: 210 km (130 mi). 1968 September 4 - . 10:42 GMT - . Launch Site: Woomera. LV Family: Musca. Launch Vehicle: Kookaburra. Met - . Nation: Australia. Agency: WRE. Apogee: 73 km (45 mi). 1968 September 4 - . 12:12 GMT - . Launch Site: Woomera. Launch Vehicle: Skua. Met - . Nation: Australia. Agency: WRE. Apogee: 58 km (36 mi). 1968 September 18 - . 11:33 GMT - . Launch Site: Woomera. Launch Vehicle: Skua. Met - . Nation: Australia. Agency: WRE. Apogee: 64 km (39 mi). 1968 September 18 - . 12:33 GMT - . Launch Site: Woomera. LV Family: Musca. Launch Vehicle: Kookaburra. Met - . Nation: Australia. Agency: WRE. Apogee: 76 km (47 mi). 1968 October 1 - . Launch Site: Woomera. Launch Complex: Woomera LA2. Launch Pad: LA2 HRV. LV Family: Rook. Launch Vehicle: Rook IIIA. Oberon 2 test - . Nation: UK. Agency: Royal Aerospace Establishment. Apogee: 20 km (12 mi). 1968 October 9 - . 00:26 GMT - . Launch Site: Woomera. LV Family: Musca. Launch Vehicle: Kookaburra. Met - . Nation: Australia. Agency: WRE. Apogee: 78 km (48 mi). 1968 October 9 - . 04:58 GMT - . Launch Site: Woomera. Launch Complex: Woomera LA2. Launch Pad: LA2 SL. LV Family: Skylark. Launch Vehicle: Skylark 1. UK SL791R test - . Nation: Australia. Agency: Royal Aerospace Establishment, WRE. Apogee: 106 km (65 mi). 1968 October 10 - . 00:18 GMT - . Launch Site: Woomera. Launch Vehicle: Skua. Met - . Nation: Australia. Agency: WRE. Apogee: 67 km (41 mi). 1968 October 10 - . 01:33 GMT - . Launch Site: Woomera. LV Family: Musca. Launch Vehicle: Kookaburra. Met - . Nation: Australia. Agency: WRE. Apogee: 70 km (43 mi). 1968 November 7 - . 20:47 GMT - . Launch Site: Woomera. LV Family: Musca. Launch Vehicle: Kookaburra. Met - . Nation: Australia. Agency: WRE. Apogee: 91 km (56 mi). 1968 November 7 - . 21:36 GMT - . Launch Site: Woomera. Launch Vehicle: Skua. Met - . Nation: Australia. Agency: WRE. Apogee: 63 km (39 mi). 1968 November 19 - . 11:34 GMT - . Launch Site: Woomera. LV Family: Musca. Launch Vehicle: Kookaburra. 1968 November 19 - . 12:03 GMT - . Launch Site: Woomera. Launch Vehicle: Skua. Met - . Nation: Australia. Agency: WRE. Apogee: 61 km (37 mi). 1968 November 20 - . 17:03 GMT - . Launch Site: Woomera. Launch Vehicle: Skua. Met - . Nation: Australia. Agency: WRE. Apogee: 66 km (41 mi). 1968 November 20 - . 18:03 GMT - . Launch Site: Woomera. LV Family: Musca. Launch Vehicle: Kookaburra. Met - . Nation: Australia. Agency: WRE. Apogee: 80 km (49 mi). 1968 November 28 - . 18:51 GMT - . Launch Site: Woomera. Launch Complex: Woomera LA2. Launch Vehicle: Aero High. Aeronomy mission - . Nation: Australia. Agency: WRE. Apogee: 150 km (90 mi). 1968 December 2 - . 22:23 GMT - . Launch Site: Woomera. Launch Vehicle: Skua. Met - . Nation: Australia. Agency: WRE. Apogee: 62 km (38 mi). 1968 December 5 - . 00:35 GMT - . Launch Site: Woomera. Launch Complex: Woomera LA2. Launch Pad: LA2 SL. LV Family: Skylark. Launch Vehicle: Skylark 3 AC. Ultraviolet solar camera Solar ultraviolet mission - . Nation: Australia. Agency: Royal Aerospace Establishment, WRE. Apogee: 182 km (113 mi). 1968 December 7 - . 04:33 GMT - . Launch Site: Woomera. Launch Complex: Woomera LA2. Launch Pad: LA2 SL. Launch Vehicle: Skylark. B / Ion / Te Ionosphere mission - . Nation: Australia. Agency: Royal Aerospace Establishment, WRE. Apogee: 154 km (95 mi). 1968 December 12 - . 18:47 GMT - . Launch Site: Woomera. Launch Complex: Woomera LA2. Launch Vehicle: Aero High. 1969 - . Launch Site: Woomera. Launch Complex: Woomera LA1. LV Family: Long Tom. Launch Vehicle: HAT. 1969 January 21 - . 04:19 GMT - . Launch Site: Woomera. Launch Complex: Woomera LA2. Launch Pad: LA2 SL. LV Family: Skylark. Launch Vehicle: Skylark 6. FAILURE: Failure. UK SL781 Solar x-ray mission - . Nation: Australia. Agency: Royal Aerospace Establishment, WRE. Apogee: 0 km (0 mi). 1969 January 23 - . 20:00 GMT - . Launch Site: Woomera. Launch Complex: Woomera LA2. Launch Pad: LA2 SL. Launch Vehicle: Skylark. B / Ion / Te Ionosphere mission - . Nation: Australia. Agency: Royal Aerospace Establishment, WRE. Apogee: 149 km (92 mi). 1969 April 1 - . Launch Site: Woomera. Launch Complex: Woomera LA2. Launch Pad: LA2 HRV. LV Family: Rook. Launch Vehicle: Jabiru 2. 1969 April 1 - . 09:54 GMT - . Launch Site: Woomera. Launch Complex: Woomera LA2. Launch Pad: LA2 SL. Launch Vehicle: Skylark. X-ray Survey X-ray astronomy mission - . Nation: UK. Agency: BAC. Apogee: 192 km (119 mi). 1969 April 3 - . 00:35 GMT - . Launch Site: Woomera. Launch Complex: Woomera LA2. Launch Pad: LA2 SL. LV Family: Skylark. Launch Vehicle: Skylark 6 AC. UK SL502 Ionosphere / solar x-rays mission - . Nation: UK. Agency: BAC. Apogee: 273 km (169 mi). 1969 April 17 - . 05:05 GMT - . Launch Site: Woomera. Launch Complex: Woomera LA2. Launch Pad: LA2 SL. LV Family: Skylark. Launch Vehicle: Skylark 3 AC. UK SL606 Solar ultraviolet and x-ray mission - . Nation: UK. Agency: BAC. Apogee: 202 km (125 mi). 1969 April 22 - . 03:31 GMT - . Launch Site: Woomera. Launch Complex: Woomera LA2. Launch Pad: LA2 SL. LV Family: Skylark. Launch Vehicle: Skylark 3 AC. UK SL604 Solar ultraviolet mission - . Nation: UK. Agency: BAC. Apogee: 181 km (112 mi). 1969 May 1 - . Launch Site: Woomera. Launch Complex: Woomera LA2. Launch Pad: LA2 HRV. LV Family: Rook. Launch Vehicle: Jabiru 2. 1969 May 14 - . 02:44 GMT - . Launch Site: Woomera. Launch Complex: Woomera LA2. Launch Pad: LA2 SL. LV Family: Skylark. Launch Vehicle: Skylark 3 AC. UK SL404 Solar ultraviolet and x-ray mission - . Nation: UK. Agency: BAC. Apogee: 178 km (110 mi). 1969 July 14 - . 23:53 GMT - . Launch Site: Woomera. Launch Complex: Woomera LA2. Launch Pad: LA2 SL. Launch Vehicle: Skylark. Electron profile Ionosphere mission - . Nation: UK. Agency: BAC. Apogee: 216 km (134 mi). 1969 July 16 - . Launch Site: Woomera. Launch Complex: Woomera LA2. Launch Pad: LA2 HRV. LV Family: Rook. Launch Vehicle: Jabiru 2. 1969 July 16 - . 22:33 GMT - . Launch Site: Woomera. Launch Complex: Woomera LA2. Launch Pad: LA2 SL. LV Family: Skylark. Launch Vehicle: Skylark 3. Dayglow / electrons Ionosphere mission - . Nation: UK. Agency: BAC. Apogee: 244 km (151 mi). 1969 July 24 - . Launch Site: Woomera. Launch Complex: Woomera LA1. LV Family: Lupus. Launch Vehicle: HAD. Nation: Australia. Agency: WRE. Apogee: 115 km (71 mi). 1969 July 25 - . 04:10 GMT - . Launch Site: Woomera. Launch Complex: Woomera LA2. Launch Pad: LA2 SL. Launch Vehicle: Skylark. Electron profile Ionosphere mission - . Nation: UK. Agency: BAC. Apogee: 213 km (132 mi). 1969 July 29 - . 22:57 GMT - . Launch Site: Woomera. Launch Complex: Woomera LA2. Launch Pad: LA2 SL. LV Family: Skylark. Launch Vehicle: Skylark 3. Dayglow / electrons Ionosphere mission - . Nation: UK. Agency: BAC. Apogee: 262 km (162 mi). 1969 August 5 - . 09:08 GMT - . Launch Site: Woomera. Launch Complex: Woomera LA1. Launch Vehicle: Aero High. Grenades - . Nation: Australia. Agency: WRE. Apogee: 208 km (129 mi). 1969 August 21 - . 01:57 GMT - . Launch Site: Woomera. Launch Complex: Woomera LA2. Launch Pad: LA2 SL. LV Family: Skylark. Launch Vehicle: Skylark 3 AC. HRCS / PHC Solar x-ray mission - . Nation: UK. Agency: BAC. Apogee: 197 km (122 mi). 1969 October 1 - . Launch Site: Woomera. Launch Complex: Woomera LA2. Launch Pad: LA2 HRV. LV Family: Stonechat. Launch Vehicle: Stonechat I.
HRV 933 test - . Nation: UK. Agency: Royal Aerospace Establishment. Apogee: 30 km (18 mi). 1969 October 15 - . 18:46 GMT - . Launch Site: Woomera. Launch Complex: Woomera LA2. Launch Pad: LA2 SL. LV Family: Skylark. Launch Vehicle: Skylark 3. Grenades / TMA release / Barium release Aeronomy /ionosphere mission - . Nation: UK. Agency: BAC. Apogee: 318 km (197 mi). 1969 October 16 - . Launch Site: Woomera. Launch Complex: Woomera LA2. Launch Pad: LA2 HRV. LV Family: Rook. Launch Vehicle: Jabiru 2. 1969 October 17 - . 09:15 GMT - . Launch Site: Woomera. Launch Complex: Woomera LA2. Launch Pad: LA2 SL. LV Family: Skylark. Launch Vehicle: Skylark 3. 1969 October 20 - . 07:28 GMT - . Launch Site: Woomera. Launch Complex: Woomera LA2. Launch Pad: LA2 SL. LV Family: Skylark. Launch Vehicle: Skylark 3 AC. UK SL586 test - . Nation: UK. Agency: BAC. Apogee: 223 km (138 mi). 1969 October 22 - . 06:10 GMT - . Launch Site: Woomera. Launch Complex: Woomera LA2. Launch Pad: LA2 SL. LV Family: Skylark. Launch Vehicle: Skylark 3. X-ray survey / Solar X X-ray astronomy mission - . Nation: UK. Agency: BAC. Apogee: 216 km (134 mi). 1969 November 18 - . 02:17 GMT - . Launch Site: Woomera. Launch Complex: Woomera LA2. Launch Pad: LA2 SL. LV Family: Skylark. Launch Vehicle: Skylark 3 AC. FAILURE: Failure. Fresnel shadowgraph X-ray astronomy mission - . Nation: UK. Agency: BAC. Apogee: 208 km (129 mi). 1969 November 20 - . 00:30 GMT - . Launch Site: Woomera. Launch Complex: Woomera LA2. Launch Pad: LA2 SL. LV Family: Skylark. Launch Vehicle: Skylark 3 AC. Solar ultraviolet Spectrum / PHC Solar ultraviolet and x-ray mission - . Nation: UK. Agency: BAC. Apogee: 242 km (150 mi). 1969 November 26 - . Launch Site: Woomera. Launch Complex: Woomera LA2. Launch Pad: LA2 HRV. LV Family: Rook. Launch Vehicle: Rook IIIA. Oberon 3 test - . Nation: UK. Agency: Royal Aerospace Establishment. Apogee: 20 km (12 mi). 1969 November 26 - . 23:32 GMT - . Launch Site: Woomera. Launch Complex: Woomera LA2. Launch Pad: LA2 SL. LV Family: Skylark. Launch Vehicle: Skylark 3 AC. Solar ultraviolet FP / PHC Solar ultraviolet mission - . Nation: UK. Agency: BAC. Apogee: 180 km (110 mi). 1969 December 9 - . Launch Site: Woomera. Launch Complex: Woomera LA1. LV Family: Lupus. Launch Vehicle: HAD. 1969 December 9 - . 01:41 GMT - . Launch Site: Woomera. Launch Complex: Woomera LA2. LV Family: Musca. Launch Vehicle: Kookaburra. Aeronomy mission - . Nation: Australia. Agency: WRE. Apogee: 73 km (45 mi). 1970 - . Launch Site: Woomera. Launch Complex: Woomera LA2. Launch Vehicle: Aero High. FAILURE: Failure. 1970 February 10 - . 14:10 GMT - . Launch Site: Woomera. Launch Complex: Woomera LA2. Launch Pad: LA2 SL. LV Family: Skylark. Launch Vehicle: Skylark 3 AC. FAILURE: Failure. ESRO S72 Ultraviolet astronomy mission - . Nation: UK. Agency: BAC, ESRO. Apogee: 244 km (151 mi). 1970 March 6 - . 02:31 GMT - . Launch Site: Woomera. Launch Complex: Woomera LA2. LV Family: Musca. Launch Vehicle: Kookaburra. Aeronomy mission - . Nation: Australia. Agency: WRE. Apogee: 93 km (57 mi). 1970 March 10 - . 03:33 GMT - . Launch Site: Woomera. Launch Complex: Woomera LA2. LV Family: Musca. Launch Vehicle: Kookaburra. 1970 March 11 - . 22:01 GMT - . Launch Site: Woomera. Launch Complex: Woomera LA2. Launch Pad: LA2 SL. LV Family: Skylark. Launch Vehicle: Skylark 3. X-ray RMC X-ray astronomy mission - . Nation: UK. Agency: BAC. Apogee: 247 km (153 mi). 1970 March 12 - . 03:48 GMT - . Launch Site: Woomera. Launch Complex: Woomera LA2. LV Family: Musca. Launch Vehicle: Kookaburra. 1970 March 16 - . 02:29 GMT - . Launch Site: Woomera. Launch Complex: Woomera LA2. LV Family: Musca. Launch Vehicle: Kookaburra. Aeronomy mission - . Nation: Australia. Agency: WRE. Apogee: 38 km (23 mi). 1970 March 18 - . 22:00 GMT - . Launch Site: Woomera. Launch Complex: Woomera LA2. Launch Pad: LA2 SL. LV Family: Skylark. Launch Vehicle: Skylark 3 AC. X-ray BCS Sco X-1 X-ray astronomy mission - . Nation: UK. Agency: BAC. Apogee: 208 km (129 mi). 1970 March 19 - . 15:18 GMT - . Launch Site: Woomera. Launch Complex: Woomera LA2. Launch Pad: LA2 SL. LV Family: Skylark. Launch Vehicle: Skylark 3 AC. Ultraviolet Schmidt Objective Prism Ultraviolet astronomy mission - . Nation: UK. Agency: BAC. Apogee: 181 km (112 mi). 1970 March 24 - . 22:00 GMT - . Launch Site: Woomera. Launch Complex: Woomera LA2. Launch Pad: LA2 SL. LV Family: Skylark. Launch Vehicle: Skylark 3 AC. X-ray Survey X-ray astronomy mission - . Nation: UK. Agency: BAC. Apogee: 179 km (111 mi). 1970 April 1 - . Launch Site: Woomera. Launch Complex: Woomera LA2. Launch Pad: LA2 HRV. LV Family: Rook. Launch Vehicle: Jabiru 2. 1970 April 7 - . 03:20 GMT - . Launch Site: Woomera. Launch Complex: Woomera LA2. Launch Pad: LA2 SL. LV Family: Skylark. Launch Vehicle: Skylark 3 AC. Solar ultraviolet echelle Solar ultraviolet mission - . Nation: UK. Agency: BAC. Apogee: 204 km (126 mi). 1970 April 16 - . 06:38 GMT - . Launch Site: Woomera. Launch Complex: Woomera LA2. LV Family: Lupus. Launch Vehicle: Cockatoo. 1970 April 16 - . 08:37 GMT - . Launch Site: Woomera. Launch Complex: Woomera LA2. Launch Pad: LA2 SL. LV Family: Skylark. Launch Vehicle: Skylark 3. X-ray spectra / Ozone X-ray astronomy mission - . Nation: UK. Agency: BAC. Apogee: 210 km (130 mi). 1970 April 16 - . 10:02 GMT - . Launch Site: Woomera. Launch Complex: Woomera LA2. LV Family: Lupus. Launch Vehicle: Cockatoo. 1970 May 21 - . 02:56 GMT - . Launch Site: Woomera. Launch Complex: Woomera LA2. LV Family: Musca. Launch Vehicle: Kookaburra. Aeronomy mission - . Nation: Australia. Agency: WRE. Apogee: 85 km (52 mi). 1970 May 21 - . 10:15 GMT - . Launch Site: Woomera. Launch Complex: Woomera LA2. LV Family: Lupus. Launch Vehicle: Cockatoo. Lunar ultraviolet Ozone Aeronomy mission - . Nation: Australia. Agency: WRE. Apogee: 96 km (59 mi). 1970 May 26 - . Launch Site: Woomera. Launch Complex: Woomera LA8. LV Family: Aerobee. Launch Vehicle: Aerobee 150. 1970 May 26 - . 03:38 GMT - . Launch Site: Woomera. Launch Complex: Woomera LA2. LV Family: Musca. Launch Vehicle: Kookaburra. Aeronomy mission - . Nation: Australia. Agency: WRE. Apogee: 87 km (54 mi). 1970 May 26 - . 07:00 GMT - . Launch Site: Woomera. Launch Complex: Woomera LA2. LV Family: Lupus. Launch Vehicle: Cockatoo. 1970 May 26 - . 14:53 GMT - . Launch Site: Woomera. Launch Complex: Woomera LA2. LV Family: Musca. Launch Vehicle: Kookaburra. Nation: Australia. Agency: WRE. Apogee: 43 km (26 mi). 1970 May 29 - . Launch Site: Woomera. Launch Complex: Woomera LA8. LV Family: Aerobee. Launch Vehicle: Aerobee 150. 1970 June 2 - . Launch Site: Woomera. Launch Complex: Woomera LA8. LV Family: Aerobee. Launch Vehicle: Aerobee 150. 1970 July 10 - . 00:30 GMT - . Launch Site: Woomera. Launch Complex: Woomera LA2. Launch Pad: LA2 SL. Launch Vehicle: Skylark. X-ray spectra / Ionos X-ray astronomy / ionosphere mission - . Nation: UK. Agency: BAC. Apogee: 203 km (126 mi). 1970 July 14 - . 03:47 GMT - . Launch Site: Woomera. Launch Complex: Woomera LA2. LV Family: Musca. Launch Vehicle: Kookaburra. 1970 July 14 - . 04:52 GMT - . Launch Site: Woomera. Launch Complex: Woomera LA2. Launch Pad: LA2 SL. LV Family: Skylark. Launch Vehicle: Skylark 6. X-ray RMC X-ray astronomy mission - . Nation: UK. Agency: BAC. Apogee: 223 km (138 mi). 1970 July 15 - . 14:00 GMT - . Launch Site: Woomera. Launch Complex: Woomera LA2. Launch Pad: LA2 SL. LV Family: Skylark. Launch Vehicle: Skylark 3 AC. Extreme ultraviolet OGS Ultraviolet astronomy mission - . Nation: UK. Agency: BAC. Apogee: 164 km (101 mi). 1970 August 31 - . 09:03 GMT - . Launch Site: Woomera. Launch Complex: Woomera LA2. LV Family: Musca. Launch Vehicle: Kookaburra. Nation: Australia. Agency: WRE. Apogee: 85 km (52 mi). 1970 October 8 - . 08:20 GMT - . Launch Site: Woomera. Launch Complex: Woomera LA2. Launch Pad: LA2 SL. LV Family: Skylark. Launch Vehicle: Skylark 6. X-ray survey X-ray astronomy mission - . Nation: UK. Agency: BAC. Apogee: 232 km (144 mi). 1970 October 14 - . 08:45 GMT - . Launch Site: Woomera. Launch Complex: Woomera LA2. Launch Pad: LA2 SL. LV Family: Skylark. Launch Vehicle: Skylark 3. X-ray RMC X-ray astronomy mission - . Nation: UK. Agency: BAC. Apogee: 270 km (160 mi). 1970 October 16 - . 00:30 GMT - . Launch Site: Woomera. Launch Complex: Woomera LA2. Launch Pad: LA2 SL. LV Family: Skylark. Launch Vehicle: Skylark 3 AC. FAILURE: Failure. ESRO S53 Solar x-ray mission - . Nation: UK. Agency: BAC, ESRO. Apogee: 209 km (129 mi). 1970 October 19 - . Launch Site: Woomera. Launch Complex: Woomera LA2. Launch Pad: LA2 SL. LV Family: Skylark. Launch Vehicle: Skylark 3 AC. FAILURE: Failure. ESRO S58 Solar ultraviolet mission - . Nation: UK. Agency: BAC, ESRO. Apogee: 200 km (120 mi). 1970 October 21 - . 09:18 GMT - . Launch Site: Woomera. Launch Complex: Woomera LA2. LV Family: Musca. Launch Vehicle: Kookaburra. 1970 October 21 - . 09:39 GMT - . Launch Site: Woomera. Launch Complex: Woomera LA2. LV Family: Lupus. Launch Vehicle: Cockatoo. 1970 October 21 - . 09:39 GMT - . Launch Site: Woomera. Launch Complex: Woomera LA2. LV Family: Musca. Launch Vehicle: Kookaburra. Nation: Australia. Agency: WRE. Apogee: 20 km (12 mi). 1970 November 5 - . 16:33 GMT - . Launch Site: Woomera. Launch Complex: Woomera LA2. LV Family: Musca. Launch Vehicle: Kookaburra. 1970 November 5 - . 18:59 GMT - . Launch Site: Woomera. Launch Complex: Woomera LA1. Launch Vehicle: Aero High. Grenades - . Nation: Australia. Agency: WRE. Apogee: 148 km (91 mi). 1970 November 6 - . 03:36 GMT - . Launch Site: Woomera. Launch Complex: Woomera LA2. LV Family: Lupus. Launch Vehicle: Cockatoo. 1970 November 6 - . 03:36 GMT - . Launch Site: Woomera. Launch Complex: Woomera LA2. LV Family: Musca. Launch Vehicle: Kookaburra. 1970 November 11 - . 04:55 GMT - . Launch Site: Woomera. Launch Complex: Woomera LA2. Launch Pad: LA2 SL. LV Family: Skylark. Launch Vehicle: Skylark 3 AC. X-ray Survey X-ray astronomy mission - . Nation: UK. Agency: BAC. Apogee: 183 km (113 mi). 1970 November 12 - . 11:00 GMT - . Launch Site: Woomera. Launch Complex: Woomera LA2. LV Family: Lupus. Launch Vehicle: Cockatoo. Lunar ultraviolet Ozone Aeronomy mission - . Nation: Australia. Agency: WRE. Apogee: 104 km (64 mi). 1970 November 19 - . 22:00 GMT - . Launch Site: Woomera. Launch Complex: Woomera LA2. Launch Pad: LA2 SL. LV Family: Skylark. Launch Vehicle: Skylark 3 AC. XRB anisotropy X-ray astronomy mission - . Nation: UK. Agency: BAC. Apogee: 209 km (129 mi). 1970 November 24 - . 22:13 GMT - . Launch Site: Woomera. Launch Complex: Woomera LA2. Launch Pad: LA2 SL. LV Family: Skylark. Launch Vehicle: Skylark 3 AC. X-ray crystal spectrometer Solar x-ray mission - . Nation: UK. Agency: BAC. Apogee: 182 km (113 mi). 1971 January 29 - . 08:25 GMT - . Launch Site: Woomera. Launch Complex: Woomera LA2. Launch Pad: LA2 SL. LV Family: Skylark. Launch Vehicle: Skylark 3 AC. XRB anisotropy X-ray astronomy mission - . Nation: UK. Agency: BAC. Apogee: 203 km (126 mi). 1971 February 2 - . 02:32 GMT - . Launch Site: Woomera. Launch Complex: Woomera LA2. LV Family: Musca. Launch Vehicle: Kookaburra. 1971 February 22 - . 11:40 GMT - . Launch Site: Woomera. Launch Complex: Woomera LA2. Launch Pad: LA2 SL. LV Family: Skylark. Launch Vehicle: Skylark 3 AC. FAILURE: Failure. ESRO S85 Ultraviolet astronomy mission - . Nation: UK. Agency: BAC, ESRO. Apogee: 222 km (137 mi). 1971 March 2 - . 10:08 GMT - . Launch Site: Woomera. Launch Complex: Woomera LA2. LV Family: Lupus. Launch Vehicle: Cockatoo. MPE Barium release? Aeronomy mission - . Nation: Australia. Agency: WRE. Apogee: 218 km (135 mi). 1971 March 2 - . 10:38 GMT - . Launch Site: Woomera. Launch Complex: Woomera LA2. Launch Pad: LA2 SL. LV Family: Skylark. Launch Vehicle: Skylark 3. UK SL922 Ionosphere mission - . Nation: UK. Agency: BAC. Apogee: 223 km (138 mi). 1971 March 2 - . 18:10 GMT - . Launch Site: Woomera. Launch Complex: Woomera LA2. LV Family: Musca. Launch Vehicle: Kookaburra. Nation: Australia. Agency: WRE. Apogee: 0 km (0 mi). 1971 March 3 - . Launch Site: Woomera. Launch Complex: Woomera LA2. Launch Vehicle: Aero High. Aeronomy mission - . Nation: Australia. Agency: WRE. Apogee: 178 km (110 mi). 1971 May 10 - . 12:03 GMT - . Launch Site: Woomera. Launch Complex: Woomera LA2. Launch Pad: LA2 SL. LV Family: Skylark. Launch Vehicle: Skylark 6 AC. FAILURE: Failure. X-ray Survey X-ray astronomy mission - . Nation: UK. Agency: BAC. Apogee: 219 km (136 mi). 1971 May 18 - . 02:37 GMT - . Launch Site: Woomera. Launch Complex: Woomera LA2. LV Family: Musca. Launch Vehicle: Kookaburra. 1971 May 18 - . 08:39 GMT - . Launch Site: Woomera. Launch Complex: Woomera LA2. LV Family: Lupus. Launch Vehicle: Cockatoo. 1971 May 18 - . 08:39 GMT - . Launch Site: Woomera. Launch Complex: Woomera LA2. LV Family: Musca. Launch Vehicle: Kookaburra. 1971 June 22 - . 02:45 GMT - . Launch Site: Woomera. Launch Complex: Woomera LA2. LV Family: Musca. Launch Vehicle: Kookaburra. 1971 July 1 - . Launch Site: Woomera. Launch Complex: Woomera LA2. Launch Pad: LA2 HRV. LV Family: Rook. Launch Vehicle: Rook IIIA. FFARV test - . Nation: UK. Agency: Royal Aerospace Establishment. Apogee: 20 km (12 mi). 1971 July 19 - . 08:37 GMT - . Launch Site: Woomera. Launch Complex: Woomera LA2. LV Family: Musca. Launch Vehicle: Kookaburra. 1971 July 19 - . 08:43 GMT - . Launch Site: Woomera. Launch Complex: Woomera LA2. LV Family: Lupus. Launch Vehicle: Cockatoo. 1971 July 20 - . 02:48 GMT - . Launch Site: Woomera. Launch Complex: Woomera LA2. LV Family: Musca. Launch Vehicle: Kookaburra. 1971 August 5 - . 02:45 GMT - . Launch Site: Woomera. Launch Complex: Woomera LA2. Launch Pad: LA2 SL. LV Family: Skylark. Launch Vehicle: Skylark 6 AC. Solar spectra Solar ultraviolet mission - . Nation: UK. Agency: BAC. Apogee: 272 km (169 mi). 1971 August 24 - . 09:05 GMT - . Launch Site: Woomera. Launch Complex: Woomera LA2. LV Family: Lupus. Launch Vehicle: Cockatoo. 1971 September 20 - . 09:18 GMT - . Launch Site: Woomera. Launch Complex: Woomera LA2. LV Family: Lupus. Launch Vehicle: Cockatoo. 1971 September 20 - . 23:56 GMT - . Launch Site: Woomera. Launch Complex: Woomera LA1. Launch Vehicle: Aero High. Nation: Australia. Agency: WRE. Apogee: 155 km (96 mi). 1971 September 21 - . 01:30 GMT - . Launch Site: Woomera. Launch Complex: Woomera LA2. LV Family: Musca. Launch Vehicle: Kookaburra. 1971 September 27 - . 02:30 GMT - . Launch Site: Woomera. Launch Complex: Woomera LA2. Launch Pad: LA2 SL. LV Family: Skylark. Launch Vehicle: Skylark 6 AC. GX3+1 Lunar Occultation X-ray astronomy mission - . Nation: UK. Agency: BAC. Apogee: 224 km (139 mi). 1971 September 29 - . 16:00 GMT - . Launch Site: Woomera. Launch Complex: Woomera LA2. Launch Pad: LA2 SL. LV Family: Skylark. Launch Vehicle: Skylark 3. ESRO S47 / 2 Ultraviolet astronomy mission - . Nation: Europe. Agency: ESRO. Apogee: 210 km (130 mi). 1971 October 7 - . 09:40 GMT - . Launch Site: Woomera. Launch Complex: Woomera LA2. Launch Pad: LA2 SL. LV Family: Skylark. Launch Vehicle: Skylark 6. X-ray RMC X-ray astronomy mission - . Nation: UK. Agency: BAC. Apogee: 233 km (144 mi). 1971 October 12 - . Launch Site: Woomera. Launch Complex: Woomera LA2. Launch Pad: LA2 SL. LV Family: Skylark. Launch Vehicle: Skylark 3. ESRO S81 X-ray Astronomy mission - . Nation: UK. Agency: BAC, ESRO. Apogee: 210 km (130 mi). 1971 October 18 - . 09:38 GMT - . Launch Site: Woomera. Launch Complex: Woomera LA2. LV Family: Lupus. Launch Vehicle: Cockatoo. 1971 October 18 - . 09:39 GMT - . Launch Site: Woomera. Launch Complex: Woomera LA2. LV Family: Musca. Launch Vehicle: Kookaburra. 1971 October 20 - . Launch Site: Woomera. Launch Complex: Woomera LA2. Launch Pad: LA2 HRV. LV Family: Rook. Launch Vehicle: Jabiru 2. 1971 October 24 - . 11:35 GMT - . Launch Site: Woomera. Launch Complex: Woomera LA2. Launch Pad: LA2 SL. LV Family: Skylark. Launch Vehicle: Skylark 6. GX3+1 Lunar Occultation X-ray astronomy mission - . Nation: UK. Agency: BAC. Apogee: 245 km (152 mi). 1971 November 8 - . 09:54 GMT - . Launch Site: Woomera. Launch Complex: Woomera LA2. LV Family: Lupus. Launch Vehicle: Cockatoo. 1971 November 24 - . 09:36 GMT - . Launch Site: Woomera. Launch Complex: Woomera LA1. LV Family: Long Tom. Launch Vehicle: HAT. Nation: Australia. Agency: WRE. Apogee: 81 km (50 mi). 1971 November 26 - . 02:30 GMT - . Launch Site: Woomera. Launch Complex: Woomera LA2. LV Family: Musca. Launch Vehicle: Kookaburra. 1971 November 30 - . 05:59 GMT - . Launch Site: Woomera. Launch Complex: Woomera LA2. Launch Pad: LA2 SL. LV Family: Skylark. Launch Vehicle: Skylark 3 AC. HRCS / X-ray imager Solar x-ray mission - . Nation: UK. Agency: BAC. Apogee: 193 km (119 mi). 1971 December 4 - . Launch Site: Woomera. Launch Complex: Woomera LA2. Launch Pad: LA2 HRV. LV Family: Rook. Launch Vehicle: Jabiru 2. 1971 December 10 - . 04:30 GMT - . Launch Site: Woomera. Launch Complex: Woomera LA2. Launch Pad: LA2 SL. LV Family: Skylark. Launch Vehicle: Skylark 3 AC. X-ray BCS Solar x-ray mission - . Nation: UK. Agency: BAC. Apogee: 198 km (123 mi). 1971 December 15 - . 10:32 GMT - . Launch Site: Woomera. Launch Complex: Woomera LA2. LV Family: Lupus. Launch Vehicle: Cockatoo. 1972 - . Launch Site: Woomera. Launch Complex: Woomera LA2. Launch Vehicle: Aero High. FAILURE: Failure. 1972 February 3 - . 10:27 GMT - . Launch Site: Woomera. Launch Complex: Woomera LA2. LV Family: Lupus. Launch Vehicle: Cockatoo. 1972 February 23 - . 03:34 GMT - . Launch Site: Woomera. Launch Complex: Woomera LA2. LV Family: Musca. Launch Vehicle: Kookaburra. 1972 February 23 - . 10:06 GMT - . Launch Site: Woomera. Launch Complex: Woomera LA2. LV Family: Lupus. Launch Vehicle: Cockatoo. 1972 March 16 - . 02:30 GMT - . Launch Site: Woomera. Launch Complex: Woomera LA2. Launch Pad: LA2 SL. LV Family: Skylark. Launch Vehicle: Skylark 6. UK SL1023 Ionosphere mission - . Nation: UK. Agency: BAC. Apogee: 260 km (160 mi). 1972 March 17 - . 05:10 GMT - . Launch Site: Woomera. Launch Complex: Woomera LA2. Launch Pad: LA2 SL. LV Family: Skylark. Launch Vehicle: Skylark 6 AC. Echelle spectra Solar ultraviolet mission - . Nation: UK. Agency: BAC. Apogee: 237 km (147 mi). 1972 March 22 - . 03:00 GMT - . Launch Site: Woomera. Launch Complex: Woomera LA2. LV Family: Musca. Launch Vehicle: Kookaburra. 1972 March 22 - . 09:33 GMT - . Launch Site: Woomera. Launch Complex: Woomera LA2. LV Family: Lupus. Launch Vehicle: Cockatoo. 1972 March 26 - . 23:30 GMT - . Launch Site: Woomera. Launch Complex: Woomera LA2. Launch Pad: LA2 SL. LV Family: Skylark. Launch Vehicle: Skylark 6 AC. ER1 Test / remote sensing mission - . Nation: UK. Agency: BAC. Apogee: 279 km (173 mi). 1972 April 19 - . 02:45 GMT - . Launch Site: Woomera. Launch Complex: Woomera LA2. LV Family: Musca. Launch Vehicle: Kookaburra. 1972 April 19 - . 10:01 GMT - . Launch Site: Woomera. Launch Complex: Woomera LA2. LV Family: Lupus. Launch Vehicle: Cockatoo. 1972 May 18 - . 02:30 GMT - . Launch Site: Woomera. Launch Complex: Woomera LA2. LV Family: Musca. Launch Vehicle: Kookaburra. 1972 May 18 - . 08:37 GMT - . Launch Site: Woomera. Launch Complex: Woomera LA2. LV Family: Lupus. Launch Vehicle: Cockatoo. 1972 May 29 - . 10:34 GMT - . Launch Site: Woomera. Launch Complex: Woomera LA2. LV Family: Lupus. Launch Vehicle: Cockatoo. Fields mission - . Nation: Australia. Agency: WRE. Apogee: 120 km (70 mi). 1972 June 15 - . 08:31 GMT - . Launch Site: Woomera. Launch Complex: Woomera LA2. LV Family: Lupus. Launch Vehicle: Cockatoo. 1972 July 5 - . Launch Site: Woomera. Launch Complex: Woomera LA2. Launch Pad: LA2 SL. LV Family: Skylark. Launch Vehicle: Skylark 6 AC. UK SL1191 - . Nation: UK. Agency: BAC. Apogee: 150 km (90 mi). 1972 July 19 - . 08:15 GMT - . Launch Site: Woomera. Launch Complex: Woomera LA1. LV Family: Long Tom. Launch Vehicle: HAT. 1972 July 20 - . Launch Site: Woomera. Launch Complex: Woomera LA1. LV Family: Lupus. Launch Vehicle: Cockatoo. O2 density - . Nation: Australia. Agency: WRE. Apogee: 130 km (80 mi). 1972 August 23 - . 02:30 GMT - . Launch Site: Woomera. Launch Complex: Woomera LA2. LV Family: Musca. Launch Vehicle: Kookaburra. 1972 September 13 - . 04:00 GMT - . Launch Site: Woomera. Launch Complex: Woomera LA2. LV Family: Musca. Launch Vehicle: Kookaburra. 1972 October 11 - . 09:03 GMT - . Launch Site: Woomera. Launch Complex: Woomera LA1. LV Family: Long Tom. Launch Vehicle: HAT. 1972 October 17 - . 18:39 GMT - . Launch Site: Woomera. Launch Complex: Woomera LA2. Launch Pad: LA2 SL. LV Family: Skylark. Launch Vehicle: Skylark 2. Composition / scattering Ionosphere mission - . Nation: UK. Agency: BAC. Apogee: 142 km (88 mi). 1972 October 23 - . 11:51 GMT - . Launch Site: Woomera. Launch Complex: Woomera LA2. Launch Pad: LA2 SL. LV Family: Skylark. Launch Vehicle: Skylark 6 AC. Soft X-ray / Lunar ultraviolet X-ray astronomy mission - . Nation: UK. Agency: BAC. Apogee: 210 km (130 mi). 1972 October 26 - . 04:30 GMT - . Launch Site: Woomera. Launch Complex: Woomera LA2. Launch Pad: LA2 SL. LV Family: Skylark. Launch Vehicle: Skylark 3 AC. X-ray BCS / RMC Solar x-ray mission - . Nation: UK. Agency: BAC. Apogee: 195 km (121 mi). 1972 November 2 - . 06:10 GMT - . Launch Site: Woomera. Launch Complex: Woomera LA2. Launch Pad: LA2 SL. LV Family: Skylark. Launch Vehicle: Skylark 6 AC. ESRO S95 X-ray Astronomy mission - . Nation: UK. Agency: BAC, ESRO. Apogee: 270 km (160 mi). 1972 November 15 - . 02:50 GMT - . Launch Site: Woomera. Launch Complex: Woomera LA2. LV Family: Musca. Launch Vehicle: Kookaburra. 1972 November 22 - . 22:55 GMT - . Launch Site: Woomera. Launch Complex: Woomera LA1. LV Family: Lupus. Launch Vehicle: Cockatoo. O2 density - . Nation: Australia. Agency: WRE. Apogee: 131 km (81 mi). 1972 December 7 - . 05:03 GMT - . Launch Site: Woomera. Launch Complex: Woomera LA2. Launch Pad: LA2 SL. LV Family: Skylark. Launch Vehicle: Skylark 3 AC. GX5-1 Lunar Occultation X-ray astronomy mission - . Nation: UK. Agency: BAC. Apogee: 248 km (154 mi). 1972 December 11 - . 00:00 GMT - . Launch Site: Woomera. Launch Complex: Woomera LA2. Launch Pad: LA2 SL. LV Family: Skylark. Launch Vehicle: Skylark 3 AC. Ions / O2 Ionosphere mission - . Nation: UK. Agency: BAC. Apogee: 196 km (121 mi). 1972 December 13 - . 03:06 GMT - . Launch Site: Woomera. Launch Complex: Woomera LA2. LV Family: Musca. Launch Vehicle: Kookaburra. 1973 January 25 - . 01:15 GMT - . Launch Site: Woomera. Launch Complex: Woomera LA2. LV Family: Lupus. Launch Vehicle: Cockatoo. 1973 January 30 - . 06:35 GMT - . Launch Site: Woomera. Launch Complex: Woomera LA2. Launch Pad: LA2 SL. LV Family: Skylark. Launch Vehicle: Skylark 3 AC. GX2+5 Lunar Occultation X-ray astronomy mission - . Nation: UK. Agency: BAC. Apogee: 234 km (145 mi). 1973 February 28 - . 20:00 GMT - . Launch Site: Woomera. Launch Complex: Woomera LA2. Launch Pad: LA2 SL. LV Family: Skylark. Launch Vehicle: Skylark 6 AC. X-ray parabolic telescope X-ray astronomy mission - . Nation: UK. Agency: BAC. Apogee: 199 km (123 mi). 1973 March 14 - . 03:15 GMT - . Launch Site: Woomera. Launch Complex: Woomera LA2. Launch Pad: LA2 SL. LV Family: Skylark. Launch Vehicle: Skylark 6 AC. Imaging spectrograph Solar x-ray mission - . Nation: UK. Agency: BAC. Apogee: 226 km (140 mi). 1973 March 20 - . 04:52 GMT - . Launch Site: Woomera. Launch Complex: Woomera LA2. Launch Pad: LA2 SL. LV Family: Skylark. Launch Vehicle: Skylark 6 AC. Echelle spectrograph Solar ultraviolet mission - . Nation: UK. Agency: BAC. Apogee: 242 km (150 mi). 1973 April 17 - . 15:35 GMT - . Launch Site: Woomera. Launch Complex: Woomera LA2. Launch Pad: LA2 SL. LV Family: Skylark. Launch Vehicle: Skylark 6 AC. Mod collimator X-ray astronomy mission - . Nation: UK. Agency: BAC. Apogee: 214 km (132 mi). 1973 June 16 - . 10:30 GMT - . Launch Site: Woomera. Launch Complex: Woomera LA2. Launch Pad: LA2 SL. LV Family: Skylark. Launch Vehicle: Skylark 6 AC. Far ultraviolet OGS Ultraviolet astronomy mission - . Nation: UK. Agency: BAC. Apogee: 227 km (141 mi). 1973 June 20 - . 23:20 GMT - . Launch Site: Woomera. Launch Complex: Woomera LA1. LV Family: Lupus. Launch Vehicle: Cockatoo. Li release - . Nation: Australia. Agency: WRE. Apogee: 100 km (60 mi). 1973 July 17 - . Launch Site: Woomera. Launch Complex: Woomera LA2. Launch Pad: LA2 SL. LV Family: Skylark. Launch Vehicle: Skylark 3 AC. Aeronomy mission? - . Nation: UK. Agency: BAC. Apogee: 210 km (130 mi). 1973 August 14 - . 08:58 GMT - . Launch Site: Woomera. Launch Complex: Woomera LA2. LV Family: Lupus. Launch Vehicle: Cockatoo Mk 4. 1973 September 19 - . 09:17 GMT - . Launch Site: Woomera. Launch Complex: Woomera LA2. LV Family: Musca. Launch Vehicle: Kookaburra 2. 1973 Q4 - . Launch Site: Woomera. Launch Complex: Woomera LA2. LV Family: Lupus. Launch Vehicle: Lorikeet. 1973 October 17 - . 09:33 GMT - . Launch Site: Woomera. Launch Complex: Woomera LA2. LV Family: Musca. Launch Vehicle: Kookaburra 2. Aeronomy mission - . Nation: Australia. Agency: WRE. Apogee: 118 km (73 mi). 1973 October 22 - . 09:38 GMT - . Launch Site: Woomera. Launch Complex: Woomera LA2. LV Family: Lupus. Launch Vehicle: Cockatoo Mk 4. Aeronomy mission - . Nation: Australia. Agency: WRE. Apogee: 138 km (85 mi). 1973 November 14 - . Launch Site: Woomera. Launch Complex: Woomera LA2 HRV. LV Family: Rook. Launch Vehicle: Jabiru 3. Ablation 1 - . Nation: Australia. Agency: Royal Aerospace Establishment. Apogee: 285 km (177 mi). 1973 November 21 - . 10:08 GMT - . Launch Site: Woomera. Launch Complex: Woomera LA2. LV Family: Musca. Launch Vehicle: Kookaburra 2. 1973 November 26 - . 05:35 GMT - . Launch Site: Woomera. Launch Complex: Woomera LA2. Launch Pad: LA2 SL. LV Family: Skylark. Launch Vehicle: Skylark 6 AC. Solar corona Solar x-ray mission - . Nation: UK. Agency: BAC. Apogee: 238 km (147 mi). 1973 December 6 - . Launch Site: Woomera. Launch Complex: Woomera LA2 HRV. LV Family: Rook. Launch Vehicle: Jabiru 3. Ablation 2 - . Nation: Australia. Agency: Royal Aerospace Establishment. Apogee: 250 km (150 mi). 1974? - . Launch Site: Woomera. Launch Complex: Woomera LA2. LV Family: Lupus. Launch Vehicle: Lorikeet Mk 2. 1974? - . Launch Site: Woomera. Launch Complex: Woomera LA2. LV Family: Lupus. Launch Vehicle: Lorikeet. 1974 February 4 - . 14:40 GMT - . Launch Site: Woomera. Launch Complex: Woomera LA2. Launch Pad: LA2 SL. LV Family: Skylark. Launch Vehicle: Skylark 6 AC. XRB / extreme ultraviolet survey X-ray / extreme ultraviolet astronomy mission - . Nation: UK. Agency: BAC. Apogee: 197 km (122 mi). 1974 April 1 - . Launch Site: Woomera. Det 2, HQ SAMSO, inactivated at Woomera, Australia. - . 1974 April 23 - . 00:03 GMT - . Launch Site: Woomera. Launch Complex: Woomera LA2. Launch Pad: LA2 SL. LV Family: Skylark. Launch Vehicle: Skylark 6 AC. Ions / Ba / Li / Te Ionosphere mission - . Nation: UK. Agency: BAC. Apogee: 177 km (109 mi). 1974 June 18 - . 05:00 GMT - . Launch Site: Woomera. Launch Complex: Woomera LA2. Launch Pad: LA2 SL. LV Family: Skylark. Launch Vehicle: Skylark 6 AC. Cen X-3 timing X-ray astronomy mission - . Nation: UK. Agency: BAC. Apogee: 234 km (145 mi). 1974 June 28 - . Launch Site: Woomera. Launch Complex: Woomera LA1. LV Family: Lupus. Launch Vehicle: Cockatoo Mk 4. 1974 July 22 - . Launch Site: Woomera. Launch Complex: Woomera LA2. Launch Pad: LA2 SL. LV Family: Skylark. Launch Vehicle: Skylark 3 AC. Ionosphere mission? - . Nation: UK. Agency: BAC. Apogee: 210 km (130 mi). 1974 September 4 - . 10:24 GMT - . Launch Site: Woomera. Launch Complex: Woomera LA8. LV Family: Aerobee. Launch Vehicle: Aerobee 200. HISTAR 8 Infrared astronomy mission - . Nation: USA. Agency: USAF CRL. Apogee: 193 km (119 mi). 1974 September 6 - . Launch Site: Woomera. Launch Complex: Woomera LA2. Launch Pad: LA2 HRV. LV Family: Rook. Launch Vehicle: Jabiru 3. Jabiru II test - . Nation: UK. Agency: Royal Aerospace Establishment. Apogee: 30 km (18 mi). 1974 September 11 - . 22:55 GMT - . Launch Site: Woomera. Launch Complex: Woomera LA8. LV Family: Aerobee. Launch Vehicle: Aerobee 200. HISTAR 9 Infrared astronomy mission - . Nation: USA. Agency: USAF CRL. Apogee: 200 km (120 mi). 1974 September 17 - . 15:33 GMT - . Launch Site: Woomera. 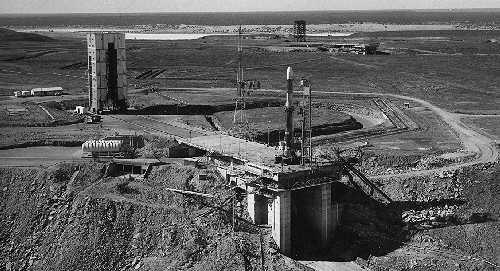 Launch Complex: Woomera LA8. LV Family: Aerobee. Launch Vehicle: Aerobee 200. HISTAR Infrared astronomy mission - . Nation: USA. Agency: USAF CRL. Apogee: 193 km (119 mi). 1974 October 1 - . 23:50 GMT - . Launch Site: Woomera. Launch Complex: Woomera LA1. LV Family: Lupus. Launch Vehicle: Cockatoo Mk 4. O2 density - . Nation: Australia. Agency: WRE. Apogee: 137 km (85 mi). 1974 October 2 - . 07:55 GMT - . Launch Site: Woomera. Launch Complex: Woomera LA1. LV Family: Lupus. Launch Vehicle: Cockatoo Mk 4. O2 density - . Nation: Australia. Agency: WRE. Apogee: 132 km (82 mi). 1974 October 4 - . 14:40 GMT - . Launch Site: Woomera. Launch Complex: Woomera LA2. Launch Pad: LA2 SL. LV Family: Skylark. Launch Vehicle: Skylark 6 AC. XRCS X-ray astronomy mission - . Nation: UK. Agency: BAC. Apogee: 196 km (121 mi). 1974 October 10 - . 05:30 GMT - . Launch Site: Woomera. Launch Complex: Woomera LA2. Launch Pad: LA2?. LV Family: Skylark. Launch Vehicle: Skylark 10A. Programmer test - . Nation: UK. Agency: BAC. Apogee: 270 km (160 mi). 1974 October 31 - . Launch Site: Woomera. Launch Complex: Woomera LA2. Launch Pad: LA2 HRV. LV Family: Rook. Launch Vehicle: Jabiru 3. 1974 November 20 - . Launch Site: Woomera. Launch Complex: Woomera LA2. Launch Pad: LA2 HRV. LV Family: Rook. Launch Vehicle: Jabiru 3. 1974 November 28 - . 16:40 GMT - . Launch Site: Woomera. Launch Complex: Woomera LA2. Launch Pad: LA2 SL. LV Family: Skylark. Launch Vehicle: Skylark 6 AC. Echelle spectrograph Ultraviolet astronomy mission - . Nation: UK. Agency: BAC. Apogee: 203 km (126 mi). 1975 February 25 - . 01:35 GMT - . Launch Site: Woomera. Launch Complex: Woomera LA2. Launch Pad: LA2 SL. LV Family: Skylark. Launch Vehicle: Skylark 7 AC. X-ray telescope Solar x-ray mission - . Nation: UK. Agency: BAC. Apogee: 282 km (175 mi). 1975 February 28 - . Launch Site: Woomera. Launch Complex: Woomera LA2. Launch Pad: LA2 SL. LV Family: Skylark. Launch Vehicle: Skylark 3 AC. 1975 March 14 - . 04:52 GMT - . Launch Site: Woomera. Launch Complex: Woomera LA2. Launch Pad: LA2 SL. LV Family: Skylark. Launch Vehicle: Skylark 6 AC. DLR W-GR-67 Solar x-ray mission - . Nation: Germany. Agency: DFVLR. Apogee: 270 km (160 mi). 1975 April 28 - . 23:45 GMT - . Launch Site: Woomera. Launch Complex: Woomera LA1. LV Family: Lupus. Launch Vehicle: Cockatoo Mk 4. O2 density - . Nation: Australia. Agency: WRE. Apogee: 124 km (77 mi). 1975 May 9 - . Launch Site: Woomera. Launch Complex: Woomera LA2. Launch Pad: LA2 HRV. LV Family: Stonechat. Launch Vehicle: Falstaff. Test mission - . Nation: UK. Agency: Royal Aerospace Establishment. Apogee: 119 km (73 mi). 1975 June 24 - . 11:18 GMT - . Launch Site: Woomera. Launch Complex: Woomera LA2. Launch Pad: LA2 SL. LV Family: Skylark. Launch Vehicle: Skylark 6 AC. Soft X-ray 1D tel X-ray astronomy mission - . Nation: UK. Agency: BAC. Apogee: 180 km (110 mi). 1975 July 3 - . Launch Site: Woomera. Launch Complex: Woomera LA2. Launch Pad: LA2 SL. LV Family: Skylark. Launch Vehicle: Skylark 6 AC. Ionosphere mission? - . Nation: UK. Agency: BAC. Apogee: 270 km (160 mi). 1975 November 6 - . 19:08 GMT - . Launch Site: Woomera. Launch Complex: Woomera LA2. Launch Pad: LA2 HAD. LV Family: Lupus. Launch Vehicle: Cockatoo. Li release - . Nation: Australia. Agency: WRE. Apogee: 150 km (90 mi). 1975 November 24 - . 15:15 GMT - . Launch Site: Woomera. Launch Complex: Woomera LA2. Launch Pad: LA2 SL. LV Family: Skylark. Launch Vehicle: Skylark 7 AC. Soft X-ray spectrometer X-ray astronomy mission - . Nation: UK. Agency: BAC. Apogee: 251 km (155 mi). 1975 December 4 - . 13:52 GMT - . Launch Site: Woomera. Launch Complex: Woomera LA2. LV Family: Lupus. Launch Vehicle: Corella. Aeronomy mission - . Nation: Australia. Agency: WRE. Apogee: 220 km (130 mi). 1976 January 30 - . 01:07 GMT - . Launch Site: Woomera. Launch Complex: Woomera LA2. Launch Pad: LA2 SL. LV Family: Skylark. Launch Vehicle: Skylark 7 AC. Quiet Coronal Structure Solar x-ray mission - . Nation: UK. Agency: BAC. Apogee: 278 km (172 mi). 1976 February 10 - . Launch Site: Woomera. Launch Complex: Woomera LA2. Launch Pad: LA2 HRV. LV Family: Stonechat. Launch Vehicle: Falstaff. Test mission - . Nation: UK. Agency: Royal Aerospace Establishment. Apogee: 117 km (72 mi). 1976 February 24 - . 21:30 GMT - . Launch Site: Woomera. Launch Complex: Woomera LA2. LV Family: Lupus. Launch Vehicle: Lorikeet Mk 2. 1976 February 25 - . 10:03 GMT - . Launch Site: Woomera. Launch Complex: Woomera LA2. LV Family: Musca. Launch Vehicle: Kookaburra 2. Nation: Australia. Agency: WRE. Apogee: 100 km (60 mi). 1976 April 29 - . Launch Site: Woomera. Launch Complex: Woomera LA2. LV Family: Lupus. Launch Vehicle: Corella. Aeronomy mission - . Nation: Australia. Agency: WRE. Apogee: 200 km (120 mi). 1976 May 12 - . 10:50 GMT - . Launch Site: Woomera. Launch Complex: Woomera LA2. Launch Pad: LA2 SL. LV Family: Skylark. Launch Vehicle: Skylark 7 AC. X-ray Telescope X-ray astronomy mission - . Nation: UK. Agency: BAC. Apogee: 231 km (143 mi). 1976 May 27 - . 00:30 GMT - . Launch Site: Woomera. Launch Complex: Woomera LA2. Launch Pad: LA2 SL. LV Family: Skylark. Launch Vehicle: Skylark 7. Test / ionosphere mission - . Nation: UK. Agency: BAC. Apogee: 254 km (157 mi). 1976 May 27 - . 03:00 GMT - . Launch Site: Woomera. LV Family: Lupus. Launch Vehicle: Cockatoo. Nation: Australia. Agency: WRE. Apogee: 103 km (64 mi). 1976 June 10 - . 17:40 GMT - . Launch Site: Woomera. Launch Complex: Woomera LA2. Launch Pad: LA2 SL. LV Family: Skylark. Launch Vehicle: Skylark 7 AC. XRCS X-ray astronomy mission - . Nation: UK. Agency: BAC. Apogee: 280 km (170 mi). 1976 June 17 - . 07:47 GMT - . Launch Site: Woomera. Launch Complex: Woomera LA2. Launch Pad: LA2 SL. LV Family: Skylark. Launch Vehicle: Skylark 7 AC. Coded mask telescope X-ray astronomy mission - . Nation: UK. Agency: BAC. Apogee: 256 km (159 mi). 1976 June 30 - . Launch Site: Woomera. Launch Complex: Woomera LA2. LV Family: Musca. Launch Vehicle: Kookaburra 3. Aeronomy mission - . Nation: Australia. Agency: WRE. Apogee: 120 km (70 mi). 1976 June 30 - . 01:36 GMT - . Launch Site: Woomera. LV Family: Lupus. Launch Vehicle: Lorikeet Mk 2. Nation: Australia. Agency: WRE. Apogee: 105 km (65 mi). 1976 August 10 - . Launch Site: Woomera. LV Family: Lupus. Launch Vehicle: Lorikeet. Mass Spec - . Nation: Australia. Agency: WRE. Apogee: 140 km (80 mi). 1976 August 11 - . Launch Site: Woomera. LV Family: Lupus. Launch Vehicle: Lorikeet. 1976 November 4 - . 07:45 GMT - . Launch Site: Woomera. Launch Complex: Woomera LA2. Launch Pad: LA2 SL. LV Family: Skylark. Launch Vehicle: Skylark 6 AC. Large Area PC X-ray astronomy mission - . Nation: UK. Agency: BAC. Apogee: 191 km (118 mi). 1976 December 2 - . 14:40 GMT - . Launch Site: Woomera. Launch Complex: Woomera LA2. Launch Pad: LA2 SL. LV Family: Skylark. Launch Vehicle: Skylark 7 AC. Ultraviolet telescope / echelle Ultraviolet astronomy mission - . Nation: UK. Agency: BAC. Apogee: 263 km (163 mi). 1977 February 15 - . 14:38 GMT - . Launch Site: Woomera. Launch Complex: Woomera LA8. LV Family: Aerobee. Launch Vehicle: Aerobee 200A. CAL X-ray study X-ray astronomy mission - . Nation: USA. Agency: NASA. Apogee: 176 km (109 mi). 1977 February 15 - . 17:10 GMT - . Launch Site: Woomera. Launch Complex: Woomera LA8. LV Family: Aerobee. Launch Vehicle: Aerobee 200A. NRL XR X-ray astronomy mission - . Nation: USA. Agency: NASA. Apogee: 189 km (117 mi). 1977 February 17 - . 14:05 GMT - . Launch Site: Woomera. Launch Complex: Woomera LA8. LV Family: Aerobee. Launch Vehicle: Aerobee 200A. Ultraviolet astronomy mission - . Nation: USA. Agency: NASA. Apogee: 197 km (122 mi). 1977 February 21 - . 14:30 GMT - . Launch Site: Woomera. Launch Complex: Woomera LA8. LV Family: Aerobee. Launch Vehicle: Aerobee 200A. JHU UVT F9 (Alpha Centauri) Astronomy mission - . Nation: USA. Agency: NASA. Apogee: 174 km (108 mi). 1977 February 23 - . 13:20 GMT - . Launch Site: Woomera. Launch Complex: Woomera LA8. LV Family: Aerobee. Launch Vehicle: Aerobee 200A. 1977 April 28 - . 12:25 GMT - . Launch Site: Woomera. Launch Complex: Woomera LA2. Launch Pad: LA2 SL. LV Family: Skylark. Launch Vehicle: Skylark 7 AC. X-ray astronomy mission - . Nation: UK. Agency: BAC. Apogee: 244 km (151 mi). 1977 June 8 - . Launch Site: Woomera. Launch Complex: Woomera LA2. Launch Pad: LA2 SL. LV Family: Skylark. Launch Vehicle: Skylark 3 AC. 1978 May 12 - . 05:01 GMT - . Launch Site: Woomera. Launch Complex: Woomera LA2. Launch Pad: LA2 SL. LV Family: Skylark. Launch Vehicle: Skylark 7 AC. Ultraviolet spectrometer Solar ultraviolet mission - . Nation: UK. Agency: BAC. Apogee: 283 km (175 mi). 1978 May 23 - . Launch Site: Woomera. Launch Complex: Woomera LA2. Launch Pad: LA2 HRV. LV Family: Stonechat. Launch Vehicle: Falstaff. FAILURE: Failure. Chevaline warhead test launch - . Nation: UK. Agency: Royal Aerospace Establishment. Apogee: 2.00 km (1.20 mi). 1978 September 15 - . Launch Site: Woomera. Launch Complex: Woomera LA2. Launch Pad: LA2 HRV. LV Family: Stonechat. Launch Vehicle: Falstaff. Chevaline warhead test launch - . Nation: UK. Agency: Royal Aerospace Establishment. Apogee: 97 km (60 mi). 1978 November 15 - . Launch Site: Woomera. Launch Complex: Woomera LA2. Launch Pad: LA2 SL. LV Family: Skylark. Launch Vehicle: Skylark 3 AC. 1978 December 6 - . Launch Site: Woomera. Launch Complex: Woomera LA2. Launch Pad: LA2 HRV. LV Family: Stonechat. Launch Vehicle: Falstaff. Chevaline warhead test launch - . Nation: UK. Agency: Royal Aerospace Establishment. Apogee: 98 km (60 mi). 1978 December 13 - . Launch Site: Woomera. Launch Complex: Woomera LA2. Launch Pad: LA2 SL. LV Family: Skylark. Launch Vehicle: Skylark 3 AC. 1979 February 14 - . Launch Site: Woomera. Launch Complex: Woomera LA2. Launch Pad: LA2 HRV. LV Family: Stonechat. Launch Vehicle: Falstaff. Chevaline warhead test launch - . Nation: UK. Agency: Royal Aerospace Establishment. Apogee: 93 km (57 mi). 1979 February 22 - . 12:15 GMT - . Launch Site: Woomera. Launch Complex: Woomera LA2. Launch Pad: LA2 SL. LV Family: Skylark. Launch Vehicle: Skylark 6 AC. Astro 4-2 X-ray Astronomy Telescope mission - . Nation: Germany. Agency: DFVLR. Apogee: 192 km (119 mi). 1979 March 1 - . Launch Site: Woomera. Launch Complex: Woomera LA2. Launch Pad: LA2 SL. LV Family: Skylark. Launch Vehicle: Skylark 6 AC. 1979 March 13 - . 00:30 GMT - . Launch Site: Woomera. Launch Complex: Woomera LA2. Launch Pad: LA2 SL. LV Family: Skylark. Launch Vehicle: Skylark 7 AC. Astro 4-1 Solar x-ray mission - . Nation: Germany. Agency: DFVLR. Apogee: 258 km (160 mi). 1979 April 4 - . Launch Site: Woomera. Launch Complex: Woomera LA2. Launch Pad: LA2 HRV. LV Family: Stonechat. Launch Vehicle: Falstaff. Chevaline warhead test launch - . Nation: UK. Agency: Royal Aerospace Establishment. Apogee: 103 km (64 mi). 1987 August 24 - . 16:30 GMT - . Launch Site: Woomera. Launch Complex: Woomera LA2. Launch Pad: LA2 D. LV Family: Skylark. Launch Vehicle: Skylark 7. Supernova X-ray telescope mission - . Nation: Germany. Agency: DFVLR. Apogee: 270 km (160 mi). 1987 November 14 - . 14:10 GMT - . Launch Site: Woomera. Launch Complex: Woomera LA2. Launch Pad: LA2 N. LV Family: Black Brant. Launch Vehicle: Black Brant IX. X-ray astronomy mission - . Nation: USA. Agency: NASA. Apogee: 300 km (180 mi). 1987 November 18 - . 13:06 GMT - . Launch Site: Woomera. Launch Complex: Woomera LA2. Launch Pad: LA2 N. LV Family: Black Brant. Launch Vehicle: Black Brant IX. 1987 December 4 - . 17:05 GMT - . Launch Site: Woomera. Launch Complex: Woomera LA2. Launch Pad: LA2 N. LV Family: Black Brant. Launch Vehicle: Black Brant IX. 1988 February 16 - . 13:34 GMT - . Launch Site: Woomera. Launch Complex: Woomera LA2. Launch Pad: LA2 N. LV Family: Black Brant. Launch Vehicle: Black Brant IX. SXS? X-ray astronomy mission - . Nation: USA. Agency: NASA. Apogee: 300 km (180 mi). 1988 February 28 - . 12:10 GMT - . Launch Site: Woomera. Launch Complex: Woomera LA2. Launch Pad: LA2 N. LV Family: Black Brant. Launch Vehicle: Black Brant IX. 1988 March 13 - . 13:34 GMT - . Launch Site: Woomera. Launch Complex: Woomera LA2. Launch Pad: LA2 N. LV Family: Black Brant. Launch Vehicle: Black Brant IX. Astronomy mission - . Nation: USA. Agency: NASA. Apogee: 300 km (180 mi). 1995 October 25 - . 13:13 GMT - . Launch Site: Woomera. Launch Complex: Woomera LA2. Launch Pad: LA2 N. LV Family: Black Brant. Launch Vehicle: Black Brant IX. X-ray astronomy mission - . Nation: USA. Agency: NASA Greenbelt. Apogee: 300 km (180 mi). 1995 October 28 - . 18:00 GMT - . Launch Site: Woomera. Launch Complex: Woomera LA2. Launch Pad: LA2 N. LV Family: Black Brant. Launch Vehicle: Black Brant IX. JHU FOT 12 (30 Dor) Ultraviolet astronomy mission - . Nation: USA. Agency: NASA Greenbelt. Apogee: 300 km (180 mi). 1995 November 5 - . 16:14 GMT - . Launch Site: Woomera. Launch Complex: Woomera LA2. Launch Pad: LA2 N. LV Family: Black Brant. Launch Vehicle: Black Brant IX. Astronomy mission - . Nation: USA. Agency: NASA Greenbelt. Apogee: 300 km (180 mi). 1995 November 14 - . 17:04 GMT - . Launch Site: Woomera. Launch Complex: Woomera LA2. Launch Pad: LA2 N. LV Family: Black Brant. Launch Vehicle: Black Brant IX. 1995 November 19 - . 15:30 GMT - . Launch Site: Woomera. Launch Complex: Woomera LA2. Launch Pad: LA2 N. LV Family: Black Brant. Launch Vehicle: Black Brant IX. WISP 2 Astronomy mission - . Nation: USA. Agency: NASA Greenbelt. Apogee: 300 km (180 mi). 1995 November 20 - . 17:00 GMT - . Launch Site: Woomera. Launch Complex: Woomera LA2. Launch Pad: LA2 N. LV Family: Black Brant. Launch Vehicle: Black Brant IX. 2001 October 30 - . 02:31 GMT - . Launch Site: Woomera. LV Family: Hawk. Launch Vehicle: Terrier Mk 70 Orion. FAILURE: Failure. Hyshot 1 'Hilary' Technology mission - . Nation: Australia. Agency: UQU. Apogee: 100 km (60 mi). First launch attempt in the HyShot Flight Program. The scramjet payload was to be used to verify pressure measurements made of supersonic combustion in The University of Queensland's T4 shock tunnel by those made in an actual flight. A failure of stabilising fins meant that the rocket fell far short of the planned 330-km apogee and the scramjet experiment was not conducted. 2002 July 14 - . 01:34 GMT - . Launch Site: Woomera. Launch Complex: Woomera LA1. LV Family: SB-735. Launch Vehicle: NAL-735. FAILURE: Failure. National Experimental Supersonic Transport NEXST-1 test - . Nation: Japan. Agency: NAL. Apogee: 0 km (0 mi). The intention was that an 11.5-m-long, one tenth scale model of the aircraft would be propelled by the NAL-735 solid rocket booster to Mach 2 at 18 km altitude. Instead the vehicle lost stability and crashed near the launch point..
2002 July 30 - . 02:05 GMT - . Launch Site: Woomera. LV Family: Hawk. Launch Vehicle: Terrier Mk 70 Orion. Hyshot 2 'Hans' Technology mission - . Nation: Australia. Agency: UQU. Apogee: 314 km (195 mi). In the second launch of the HyShot program, the Terrier-Orion Mk70 rocket boosted the payload, which remain attached to the second stage Orion motor, toward a planned apogee of 330 km. After peaking at 314 km, the trajectory was designed so that the payload was moving at Mach 7.6 between 35 km and 23 km on the way down, at which point the measurements of supersonic combustion were made. This was claimed to be the first successful test of a scramjet in flight. 2005 October 9 - . 21:36 GMT - . Launch Site: Woomera. Launch Complex: Woomera LA1. LV Family: SB-735. Launch Vehicle: NAL-735. NEXST-1 F2 - . Nation: Japan. Agency: NAL. Apogee: 20 km (12 mi). 2006 March 25 - . 03:15 GMT - . Launch Site: Woomera. LV Family: Hawk. Launch Vehicle: Terrier Mk 70 Orion. HyShot 3 - . Nation: Australia. Agency: UQU. Apogee: 325 km (201 mi). The 100-kg test British-design scramjet engine was boosted to an altitude of 314 km during a 10-minute flight. It and the attached second stage then were re-oriented to point back to the Earth. The scramjet was successfully ignited at a speed of Mach 8 in the tiny six-second window of opportunity shortly before impact. 2006 March 30 - . 02:40 GMT - . Launch Site: Woomera. LV Family: Hawk. Launch Vehicle: Terrier Mk 70 Orion. Hyshot 4 (JAXA) - . Nation: Australia. Agency: UQU. Apogee: 290 km (180 mi). A repeat of the test four days earlier, this time with a Japanese-designed scramjet. The nosecone of the rocket failed to jettison and therefore scramjet ignition was not achieved. The scramjet and second stage remains were located in the desert and recovered after only 20 minutes of searching. 2016 May 18 - . 00:45 GMT - . Launch Site: Woomera. LV Family: Sonda. Launch Vehicle: VS-30/Orion. HiFire-5B - . Nation: Australia. Apogee: 278 km (172 mi). Hypersonic vehicle test mission. Impacted in Woomera Range. Joint US/Australian hypersonic-research flight..
2017 July 9 - . Launch Site: Woomera. LV Family: Sonda. Launch Vehicle: VSB-30. HiFire-4 - . Nation: Australia. Apogee: 300 km (180 mi). Hypersonic mission. Impacted Woomera Range..